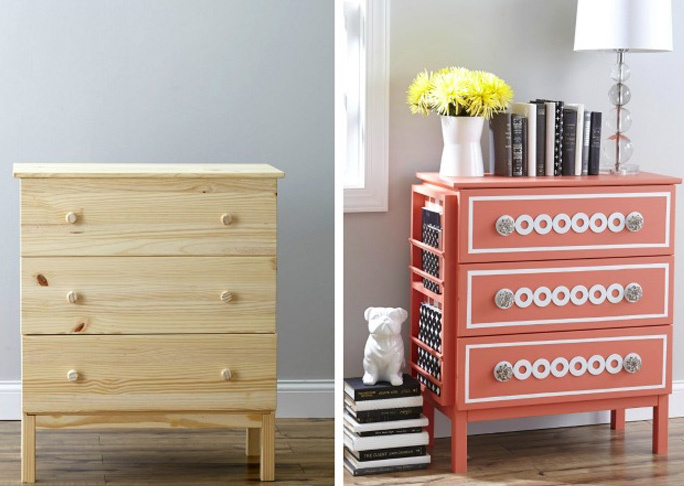 This IKEA hack turns a plain, raw wood dresser into a glamorous coral statement piece. See the project at Thistlewood Farms. Need some more Mid Century design in your life? 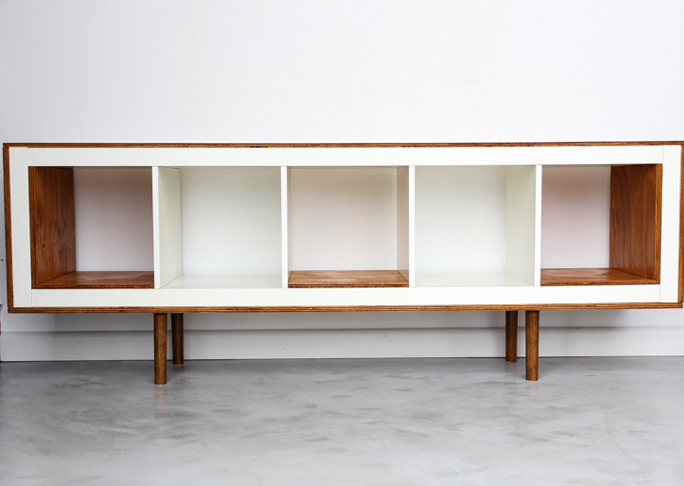 How about converting a bookcase into a classic sideboard? See the project at IKEA Hackers. 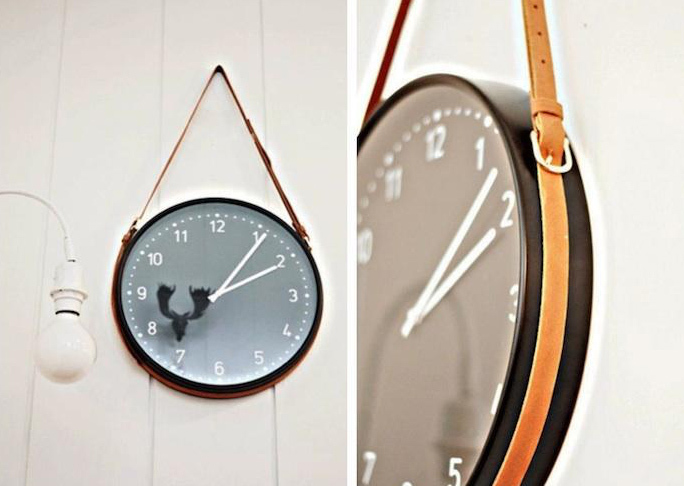 This simple idea to add a belt to a clock as a hanging mechanism upgrades a basic timepiece into a statement for your wall. See the project at Remodelista. Everything looks great with a fresh dose of color! 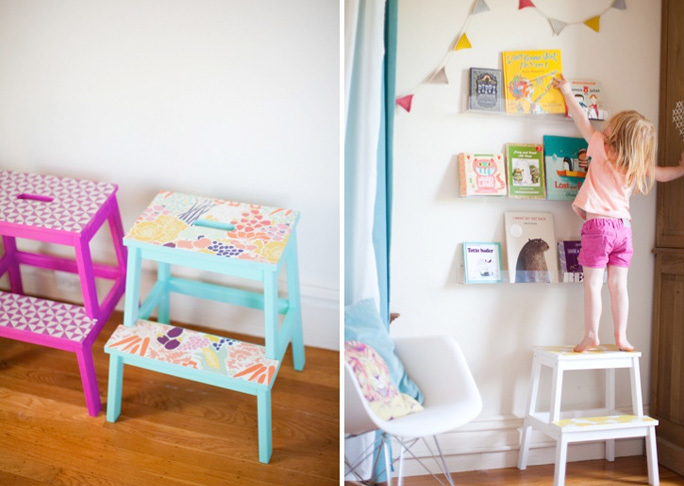 Add wallpaper and paint to these step stools to make them pop. See the project at This Little Street. 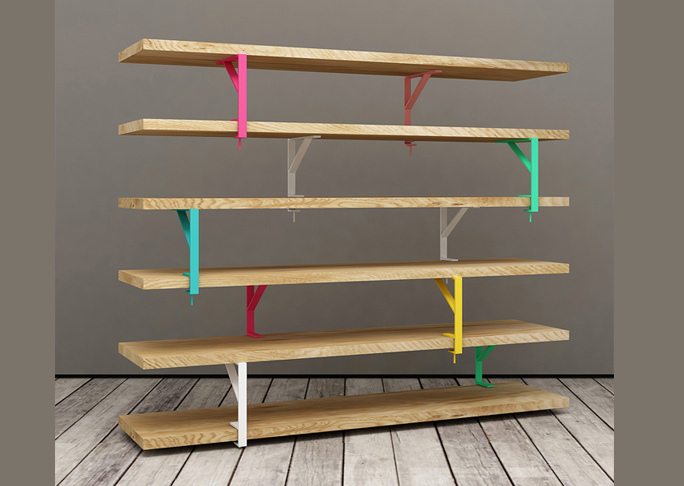 These shelving brackets create a colorful bookcase out of plank shelving. A creative and artistic accomplishment. See the project at Stilsucht.de. 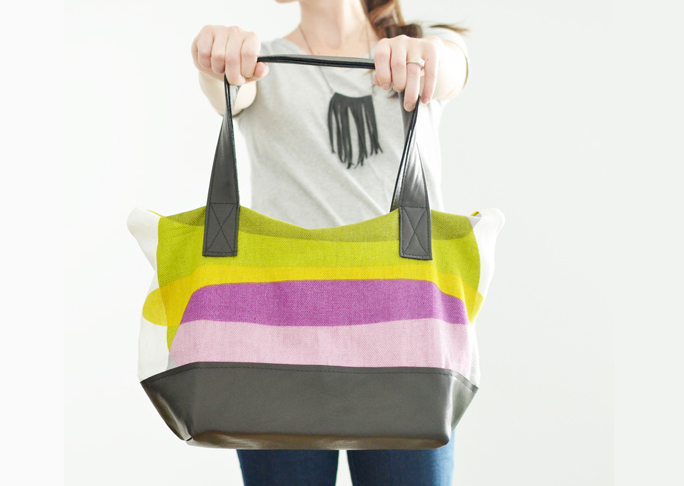 Testing your sewing skills and leather workmanship can turn a simple pillowcase into a fancy tote bag. See the project at Melissa Esplin. IKEA has an amazing product called Stikwood that can turn a simple white headboard into a beautiful faux wood statement piece. See the project at Sugar & Cloth. 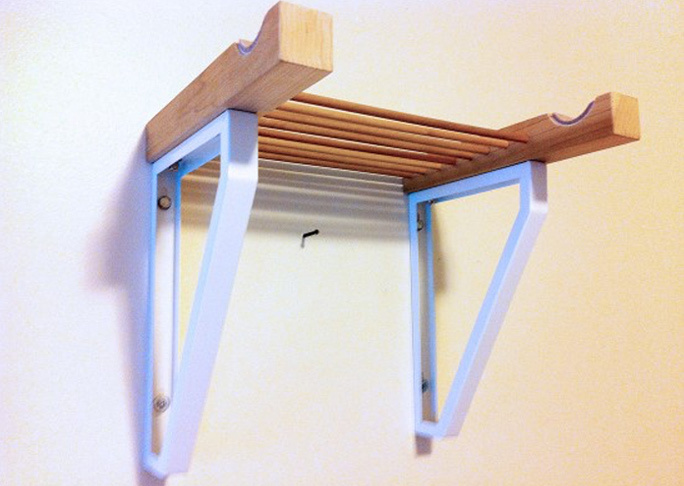 IKEA hacks that create something out of a random product are my favorites. 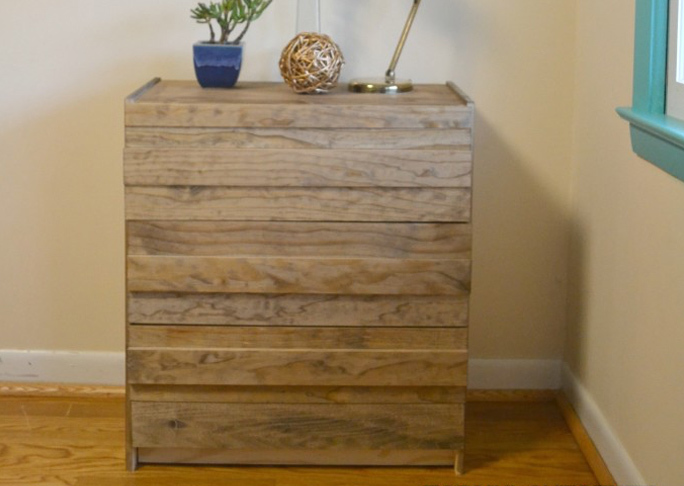 This one uses the frame of an old hamper to make a beautiful end table. See the project at The Clever Bunny. 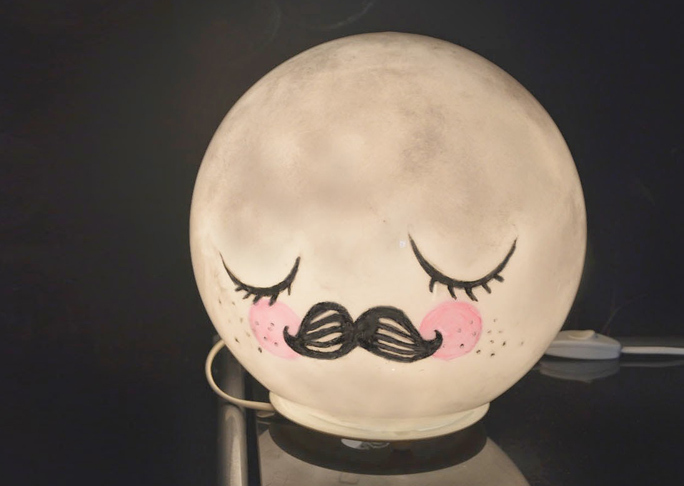 Inspired by a classic art print, this DIY turns a lamp into the most adorable nightlight there is. See the project at Mommo Design. 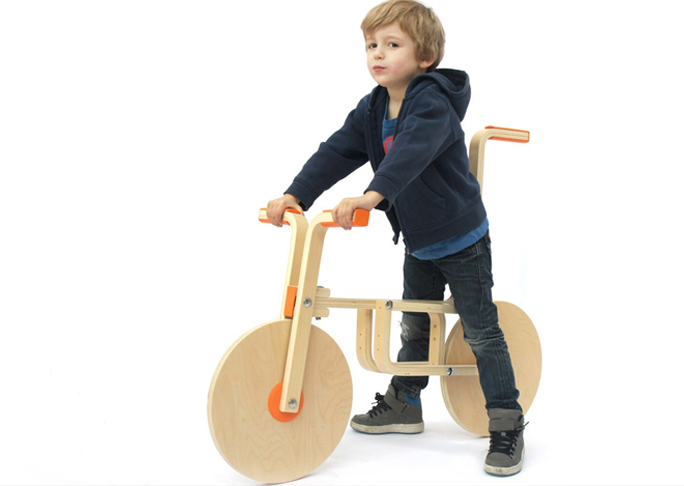 This is one of the more ingenious IKEA hacks---these guys turned a couple of stools into a fully functioning push bike for kids. See the project at Mashable. 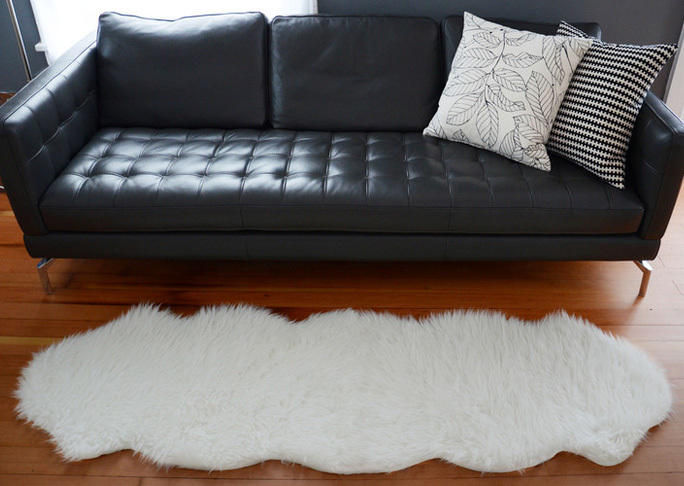 Tired of your IKEA sheepskin rug being so tiny? Double it up to make a furry runner! See the project at Old House New Tricks. 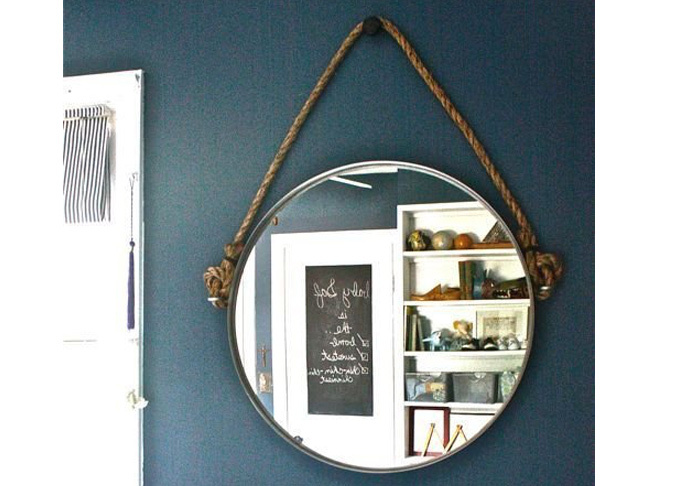 Based on a Restoration Hardware product, this mirror and rope hack can save you a ton of money on getting the look you want. See the project at Apartment Therapy. 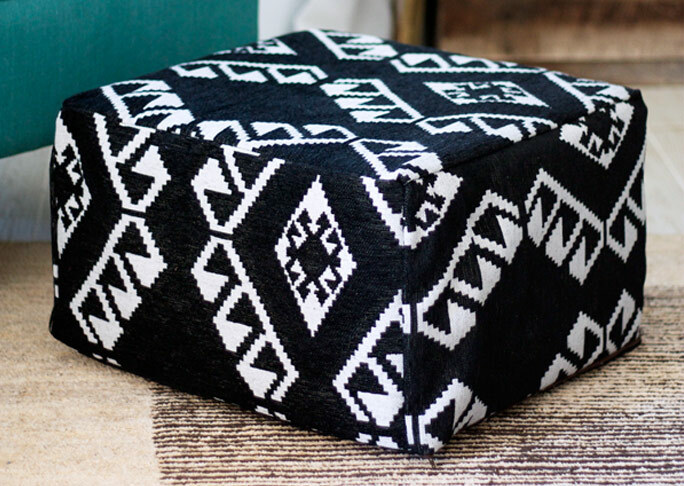 The interior design world is obsessed with Moroccan poufs right now. Here's a fun DIY to make one of your own on the cheap. See the project at Kristi Murphy. 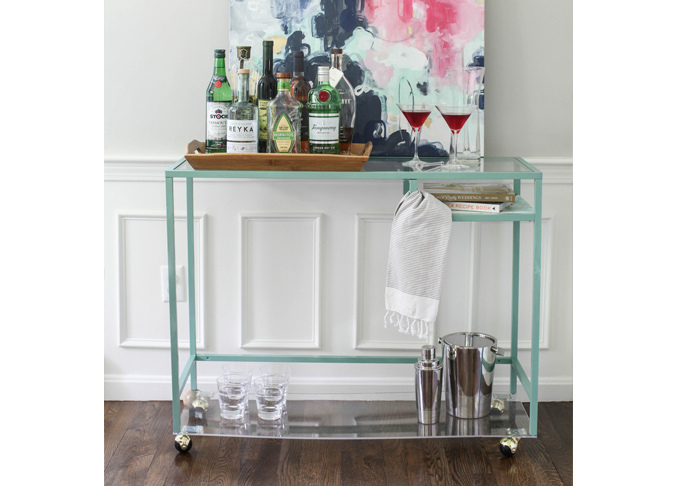 Every home needs a quality bar cart. 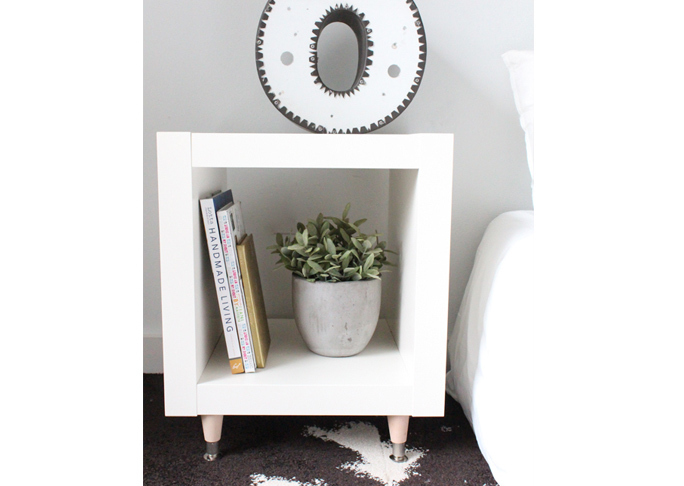 Here's a DIY to make one of your own from an IKEA table. See the project at Style Me Pretty. Metallic textures can make any IKEA product seem way more glamorous than it is. 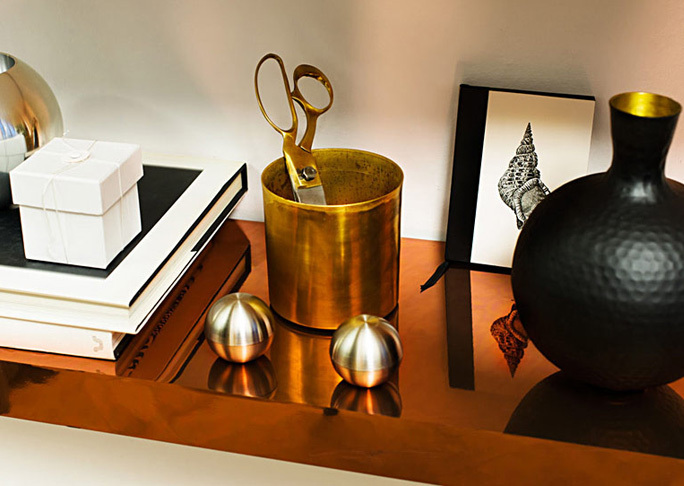 These copper covered shelves are to die for. See the project at IKEA. Get that IKEA furniture up off the ground! 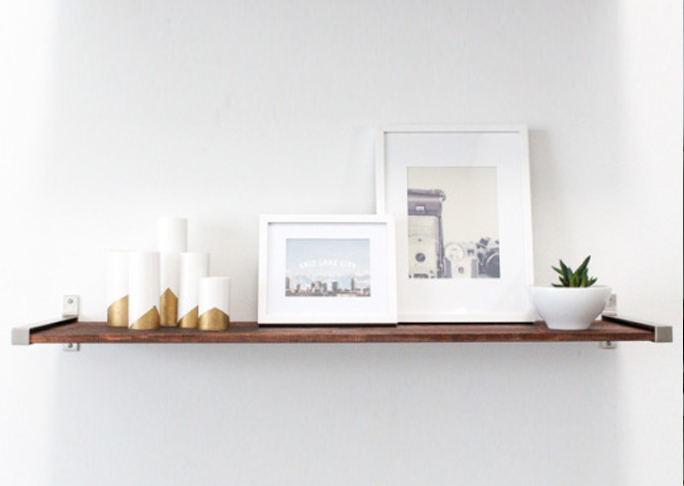 Here's a great example of how to float your new credenza on the wall. An absolutely gorgeous custom library wall is made from three Billy bookcases and some crown moulding. 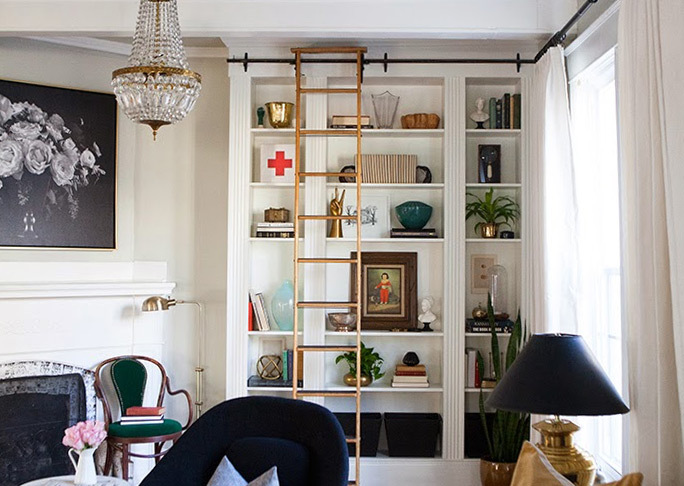 That ladder is everything. See the project at The Makerista. 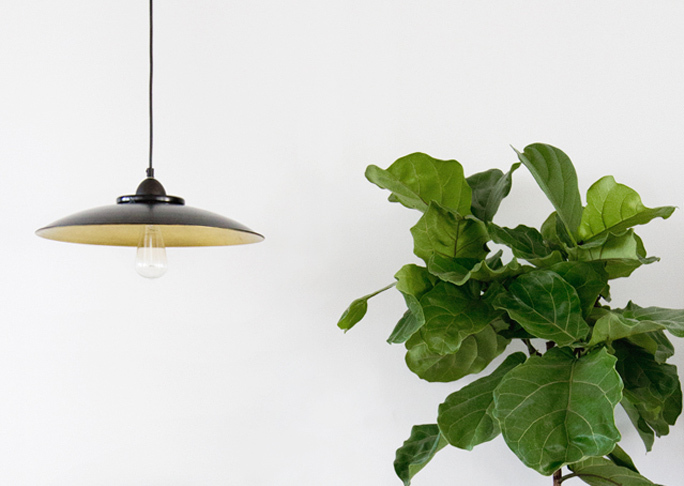 This IKEA hack turns a platter into a modern hanging light fixture. See the project at Smitten Studio. 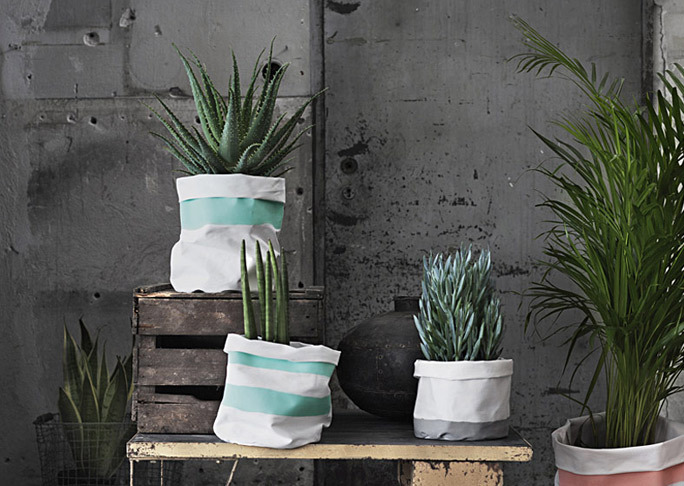 Painted textiles from IKEA formed into planters are a unique and interesting way to grow your houseplants. 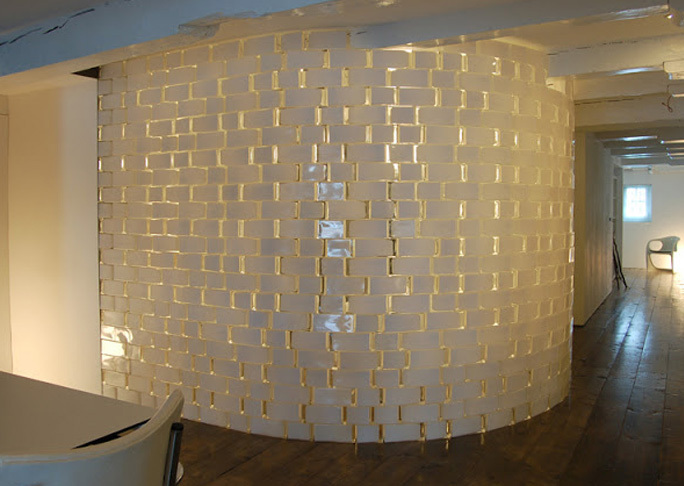 This amazing bathroom installation used glass vases from IKEA as bricks to form a curving privacy wall. It's like your very own igloo! 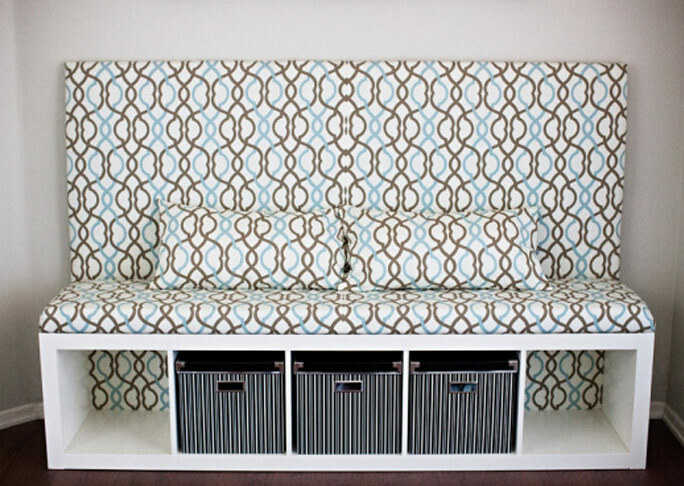 Using an Expedit bookcase and some upholstery skills, you can create your own banquette seating area. See the project at Melodrama. 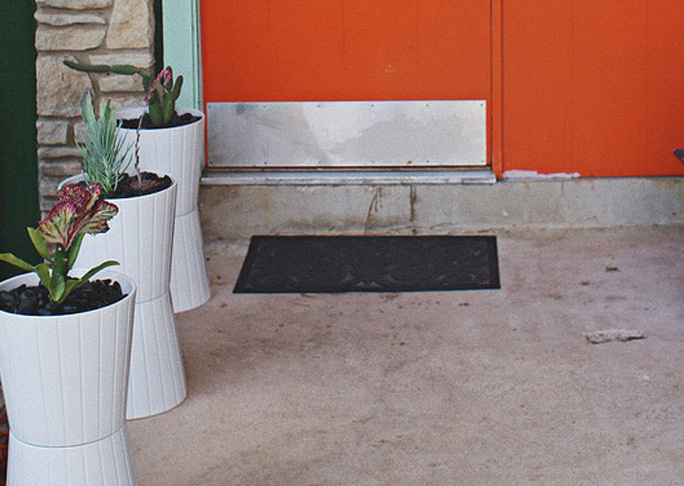 Double up your IKEA planters for a Mid Century Modern look on your porch. See the project at Brady Bunch Remodel. 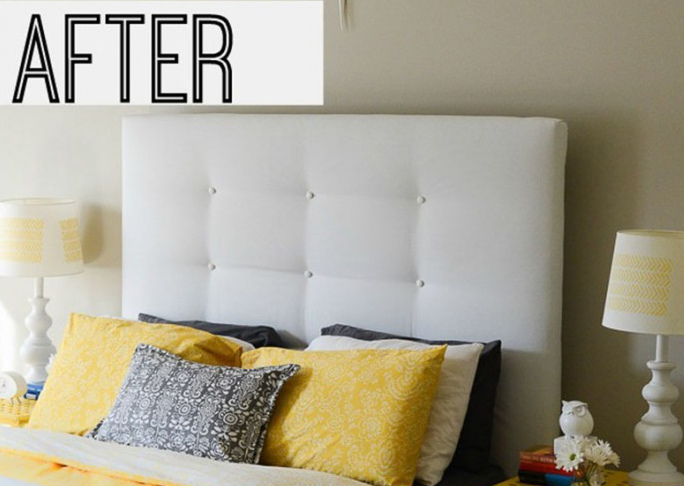 Dying for some sconces next to your bed? 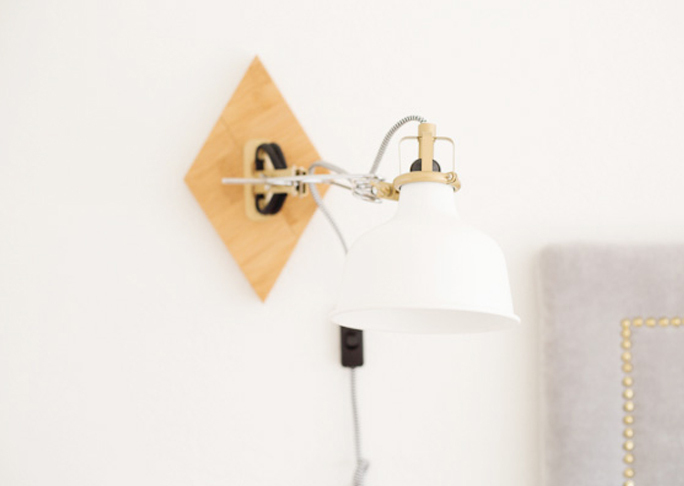 Turn one of IKEA's shelving brackets into your very own hanging light stand. 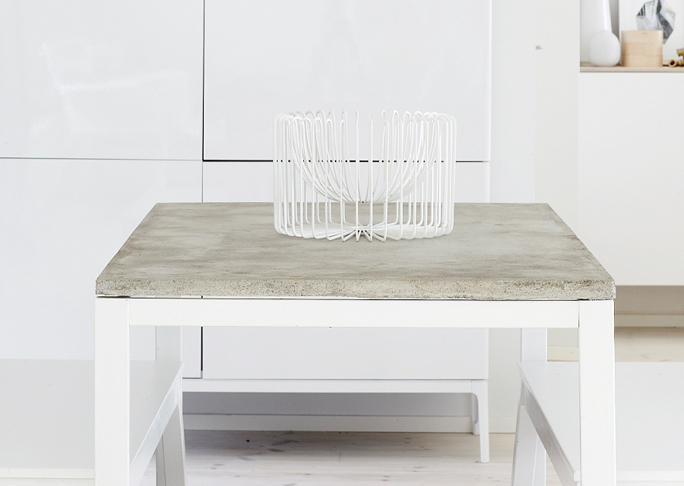 See the project at Nalle's House. 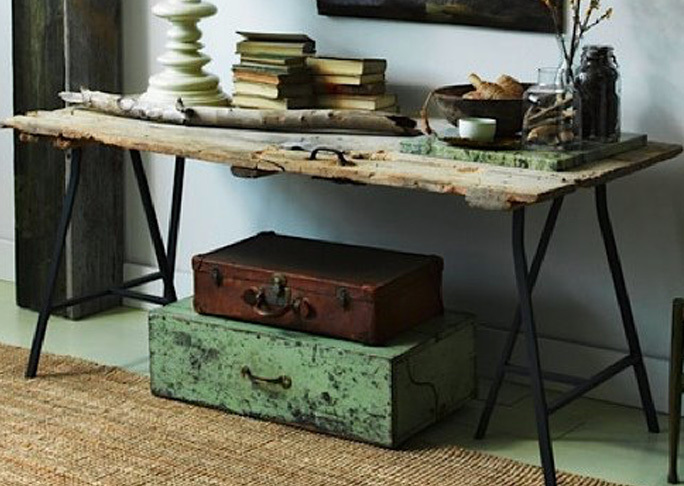 Want to bring a little rustic farmhouse feel to the Swedish sensibility? 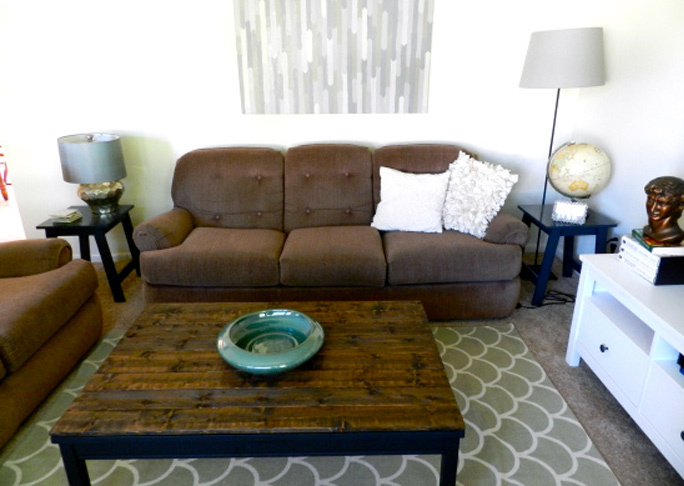 Upgrade your coffee table with some reclaimed wood and stain. See the project at Rachel Schultz. 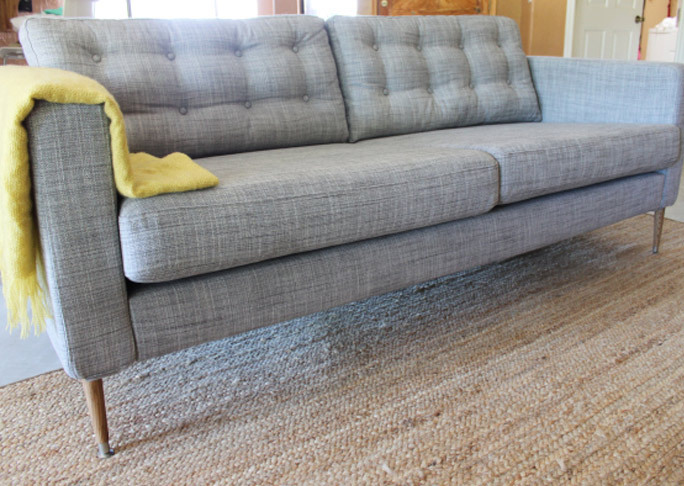 Adding tufts to your IKEA couch cushions can easily make your $300 couch look like a $3,000 one. See the project at Honey Badger Home. 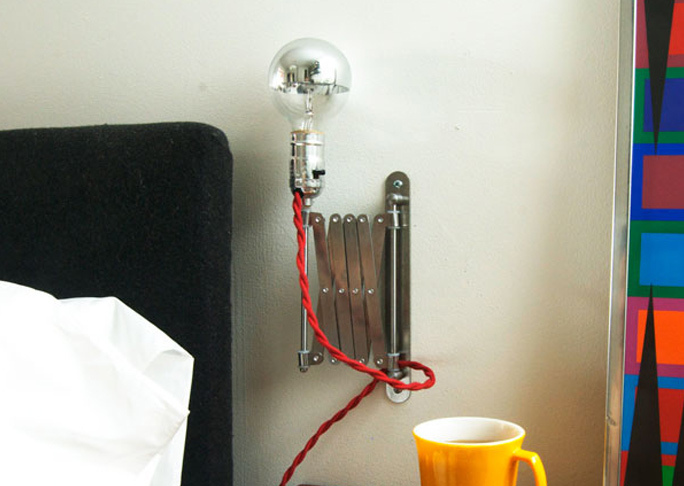 Want those wall sconces to be able to stretch over your bed for a little late night reading? Try hacking an expanding vanity mirror into your bedside lamp. See the project at Manhattan Nest. Every little kid wants bunk beds. 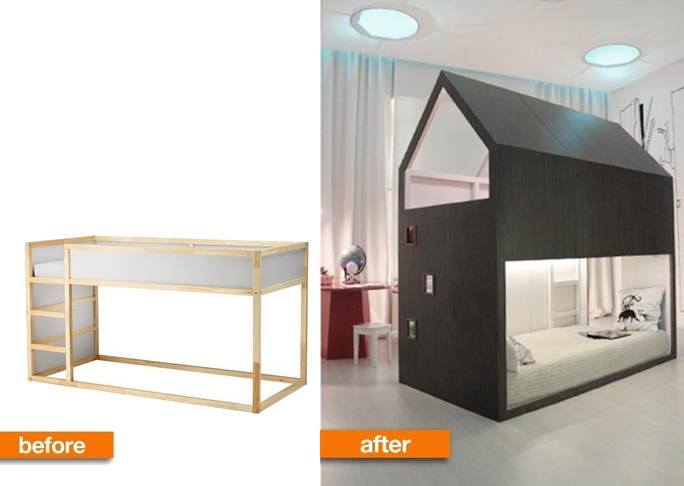 But how about bunk beds that look like your own custom playhouse? 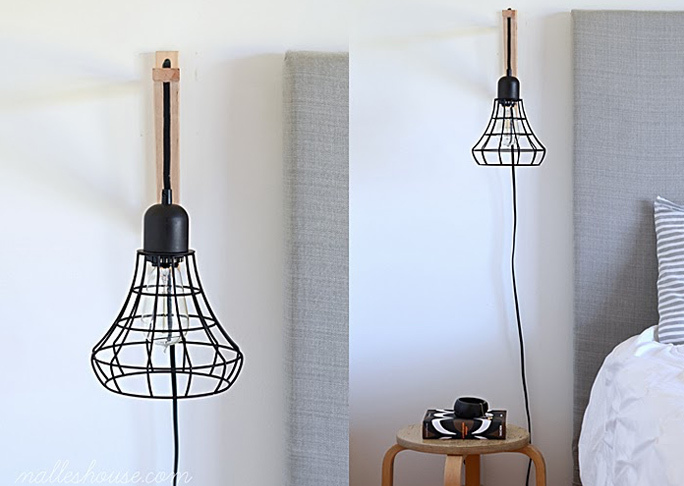 This industrial desk lamp is made from an IKEA lamp, some wood slats, and some cement. 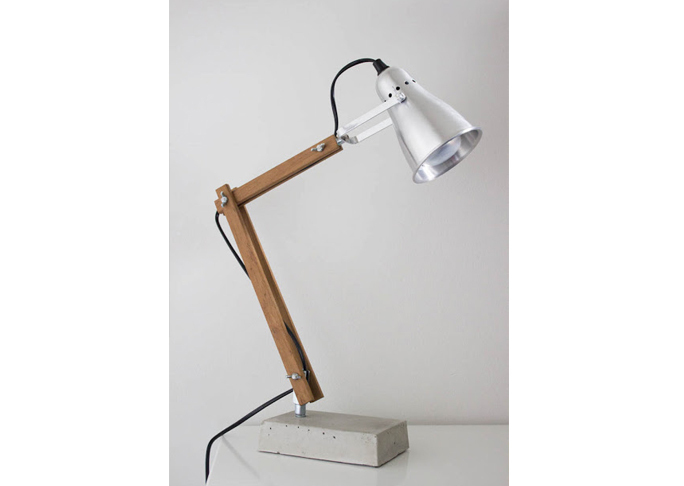 A beautiful statement lamp for any desk. 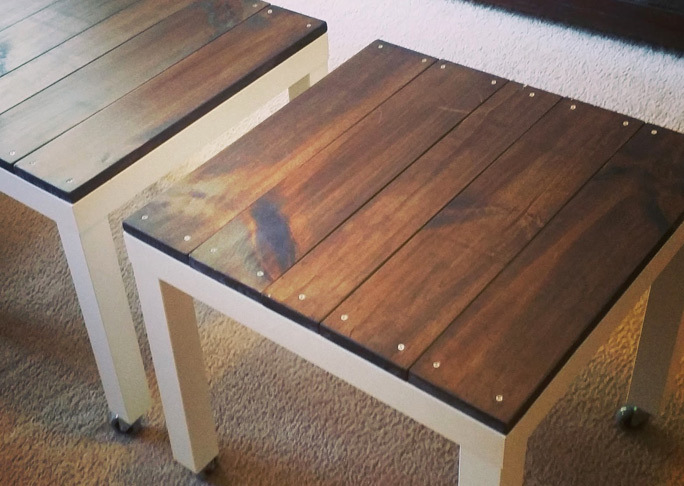 So much can be done to your furniture by just switching out the legs! 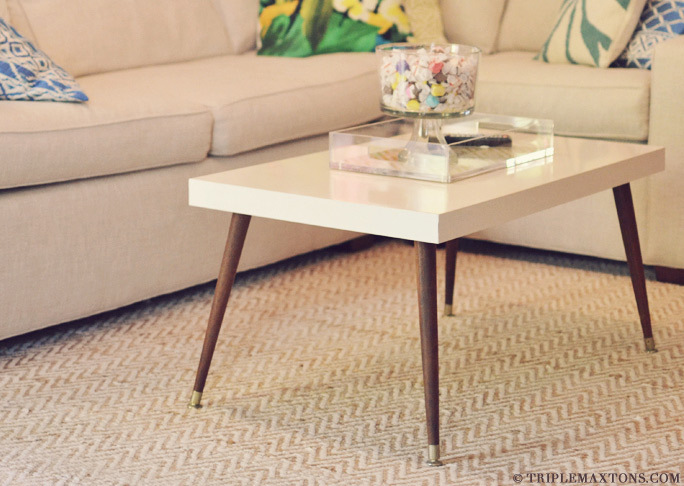 This Lack coffee table suddenly looks like it is straight out of 1955 with these ones. See the project at Triple Max Tons. Want a set of card files for your desk? 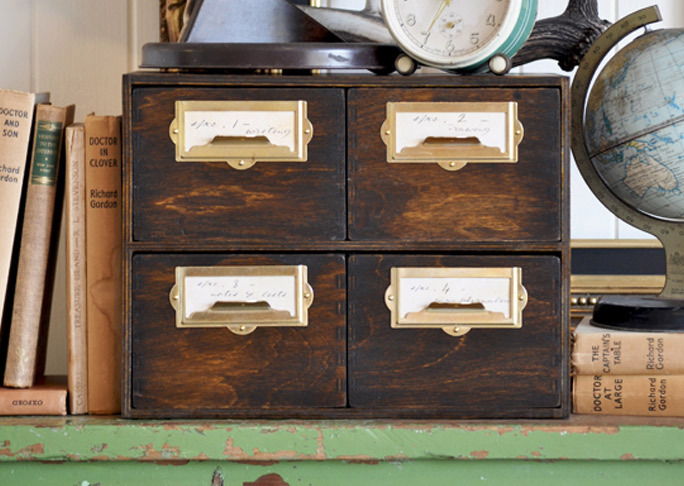 Here's how to make your own antique looking version. See the project at The Painted Hive. One of my favorite IKEA hacks, this expandable coffee table is made from file folders. Its construction is absolutely ingenious, and there are so many combinations! 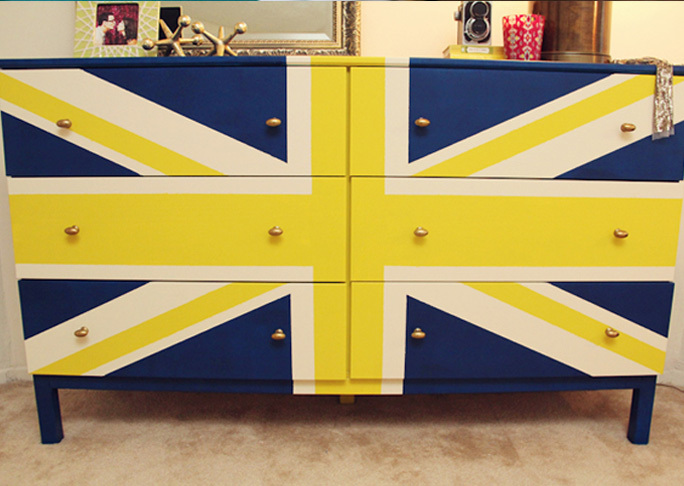 Bring a little UK love into your home and make your very own Union Jack dresser! See the project at Lovely Indeed. 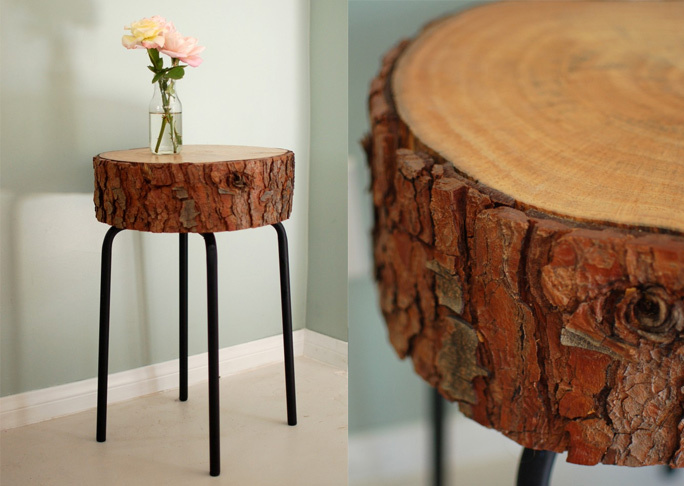 I love mixing rustic and industrial textures, and this log slice table is the best of both worlds. See the project at Seakettle. 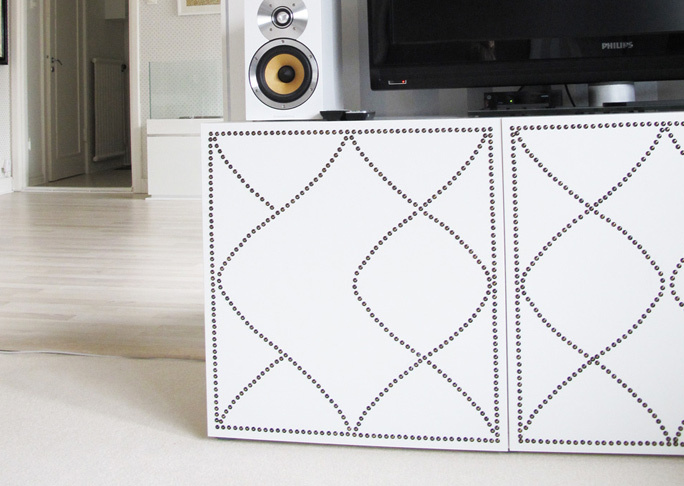 This will take you a long time to make perfect, but adding nailhead trim to your entertainment stand is a gorgeous IKEA upgrade. See the project at Signed by Tina. This IKEA hack makes a safe way for kids to help out in the kitchen. 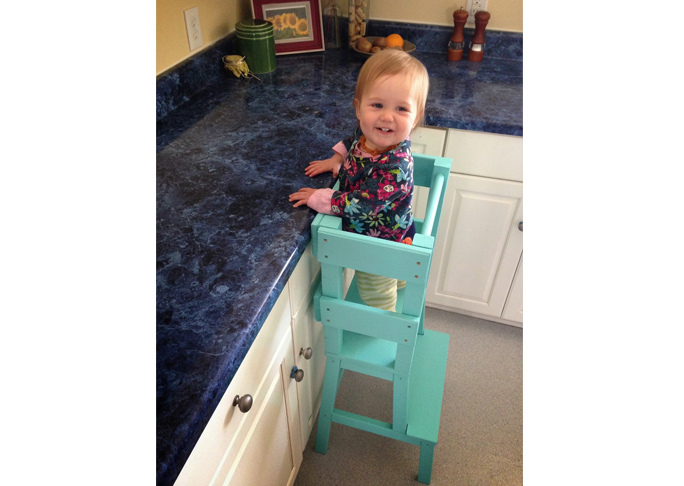 They can stand on the altered step stool without any fear of toppling over. See the project at In the Hollow Heart. 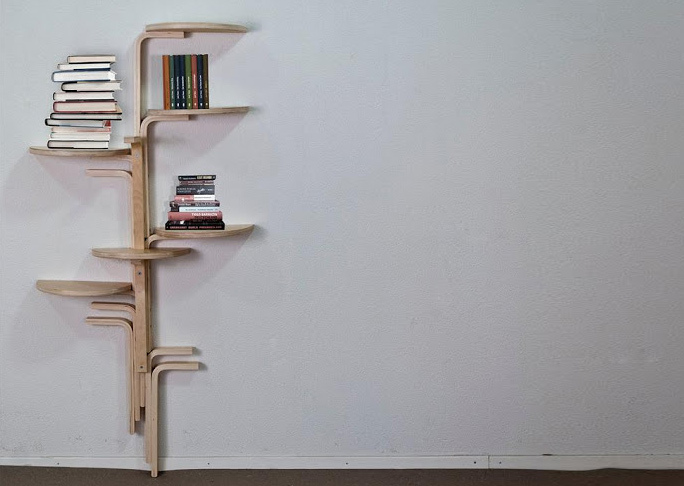 Another hack of the classic IKEA stool---these guys turned a few of them into a unique bookcase tree. 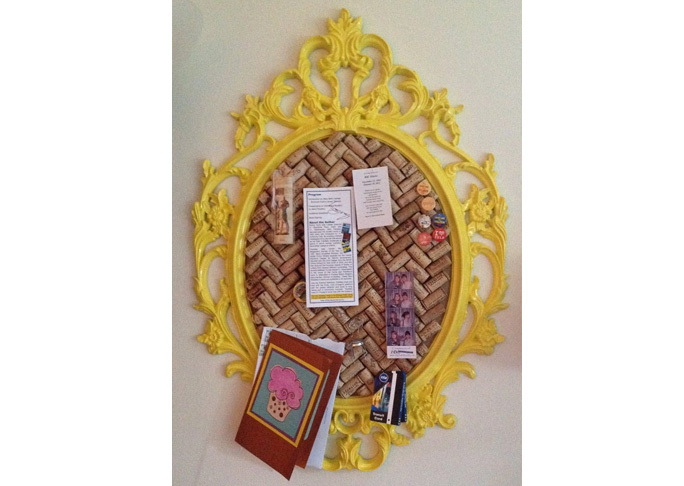 Turn this decorative frame into a fun message board by adding a corkboard of old wine bottle corks. See the project at Suze Geeks Out. 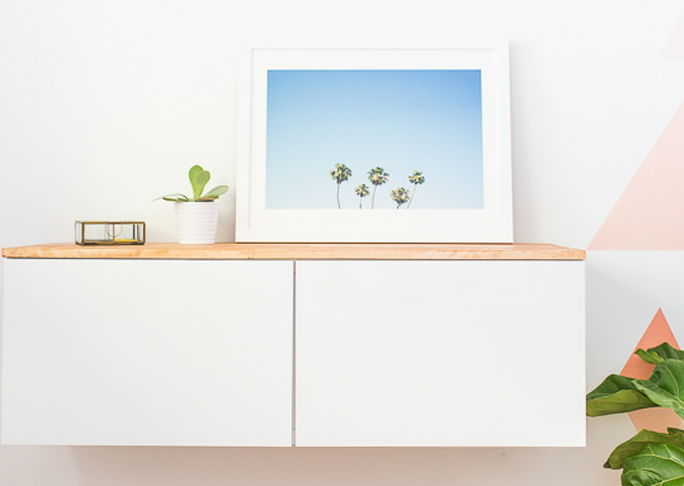 This minimal lumber addition turns a simple IKEA table into a glamorous and modern desk. See the project at Matsutake Blog. IKEA's bathroom and kitchen departments can be a little daunting, but you can make magic happen if you put your mind to it. 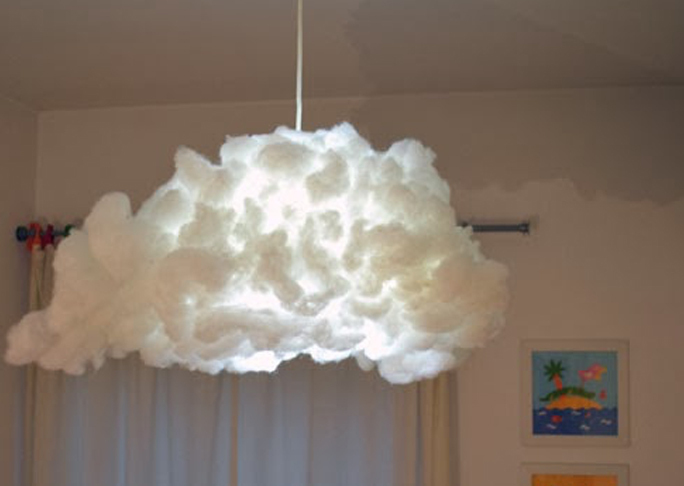 This genius lamp turns a basic hanging lamp into a mystical cloud lamp for a kid's room. An awesome addition to a sky themed nursery. 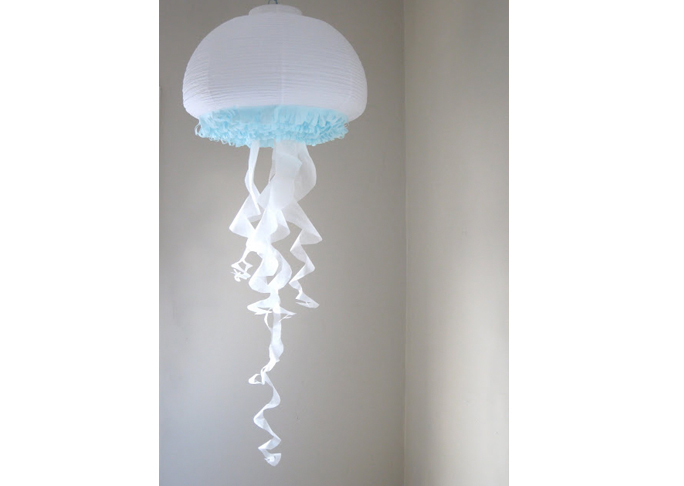 And on the contrary, this jellyfish lamp DIY would make an awesome addition to an ocean themed nursery. See the project at Paper & Ink. 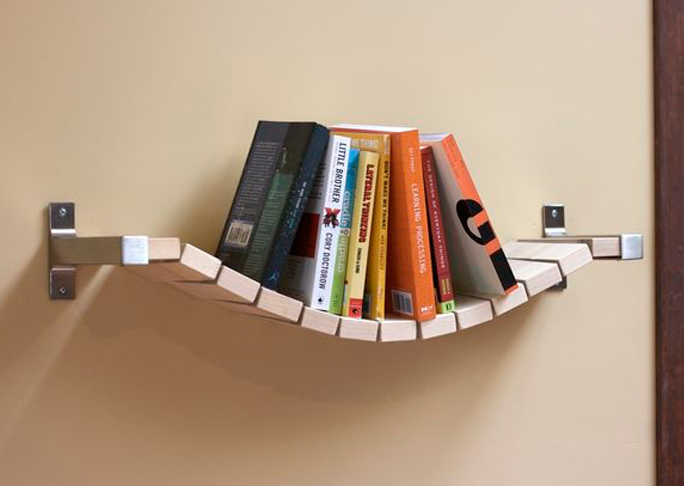 A really fun DIY hack turns a regular shelf into a rope bridge shelf that floats with your books. See the project at Instructables. Every kid needs their own mini kitchen to play pretend in. Here's how to build your own out of IKEA furniture. 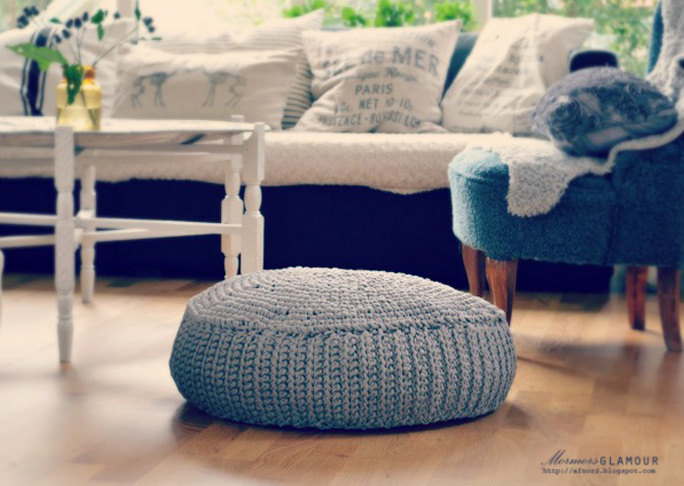 A little bit of crocheting turns a hard and unforgiving wicker stool into a cozy spot to sit. See the project at Mormorsglamour. 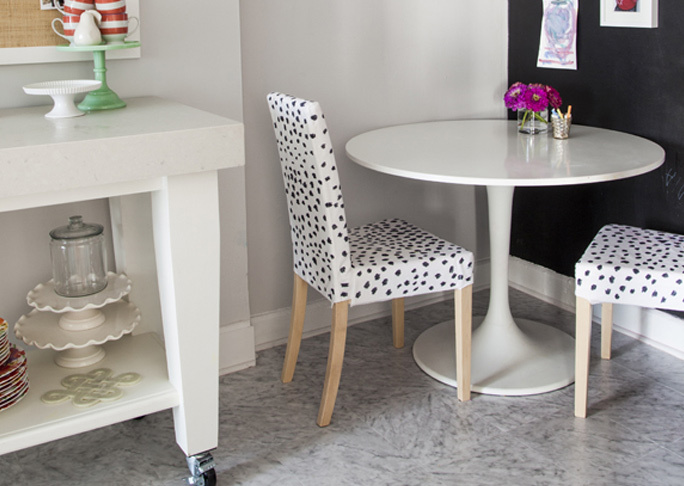 Upgrade those plain white chairs with a little Sharpie art. Disregard everything your mom told you about not playing with permanent markers. See the project at Little Green Notebook. I want to make custom concrete tops for all of my furniture now. 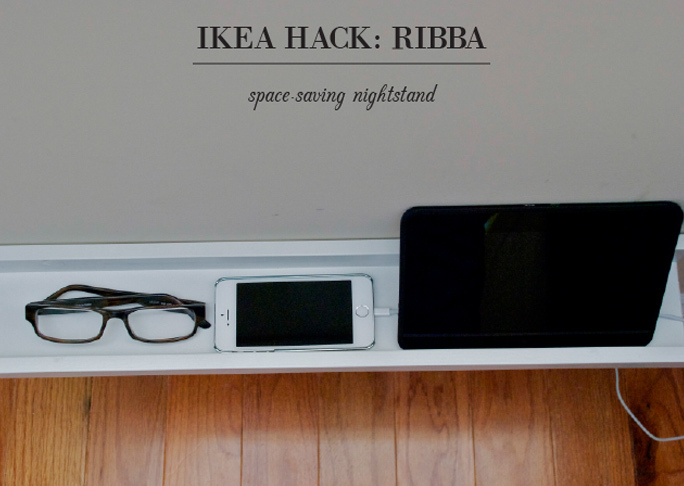 This IKEA hack is amazing. See the project at Weekdaycarnival. This one was made by yours truly. I turned some clip lamps into a geometric wall sconce. 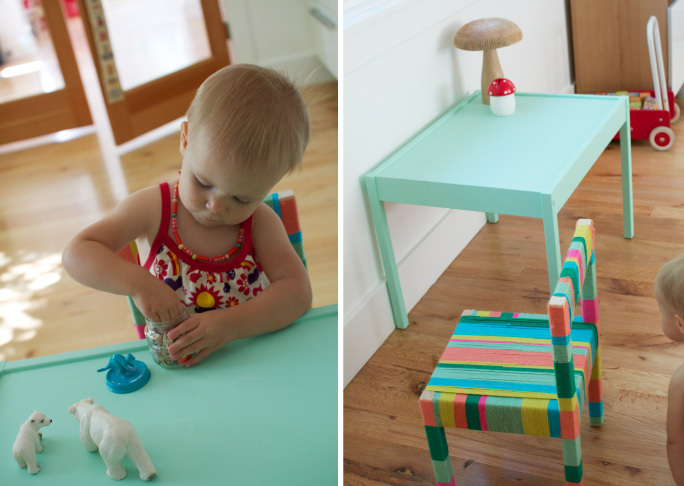 This is the perfect way to add a splash of color to a kid's playroom; just wrap all the furniture in colorful yarn! See the project at One More Mushroom. 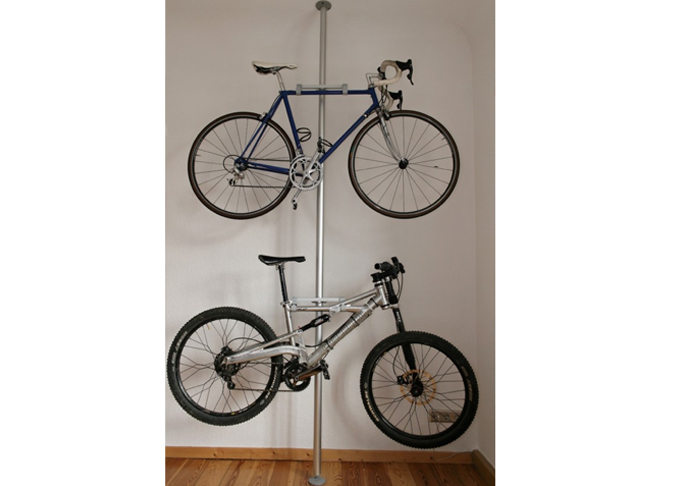 One of the more industrial IKEA hacks, a way to hang your bicycles indoors on a stacked pipe. 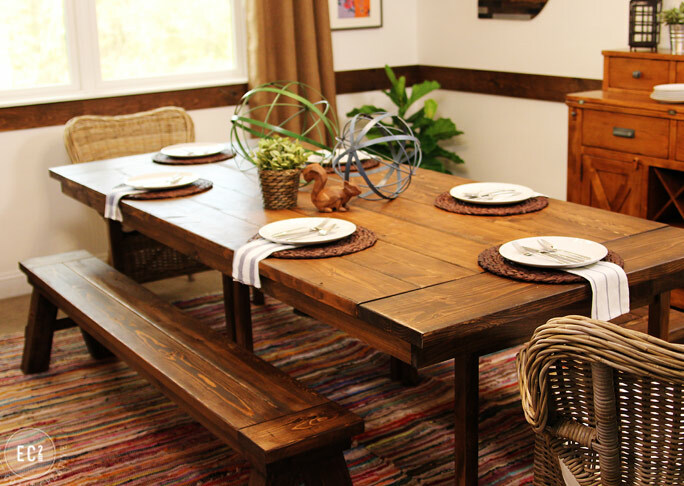 This DIY takes two normal IKEA tables and turns them into a long, rustic farmhouse table. See the project at East Coast Creative Blog. 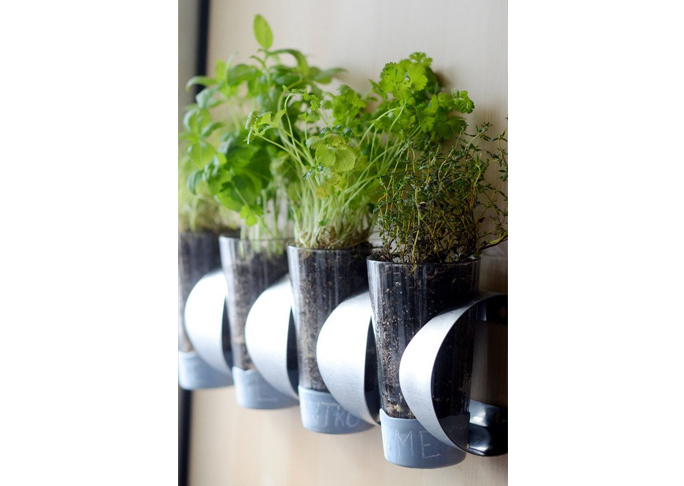 Using an IKEA wine rack and some plastic cups, you can create a small herb garden for your kitchen. Throw in some chalkboard paint, and you can even label your plants. See the project at Curbly. 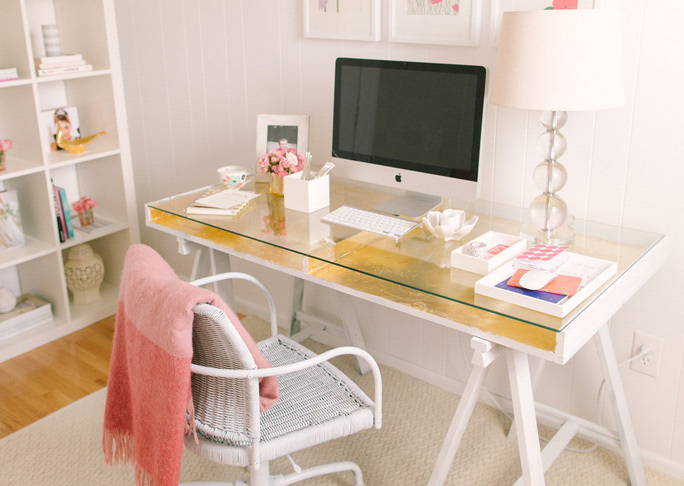 Glam up your white desk with some faux brass drawer fronts. I love the pop of metallic texture. 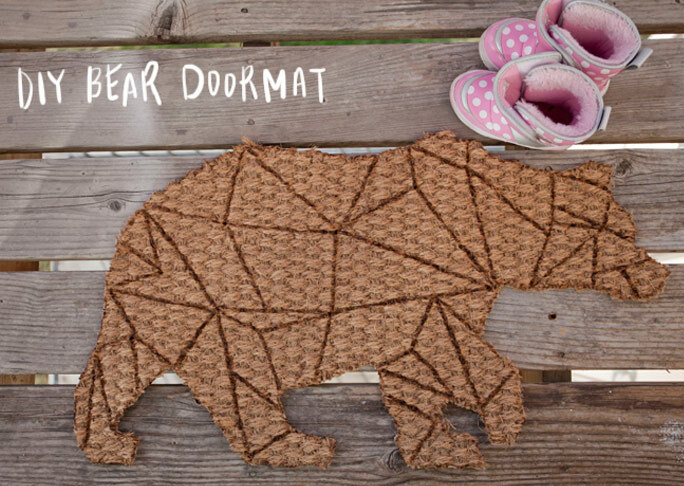 This geometric doormat would look great in front of a log cabin or Mid Century Modern home. See the project at Vintage Revivals. 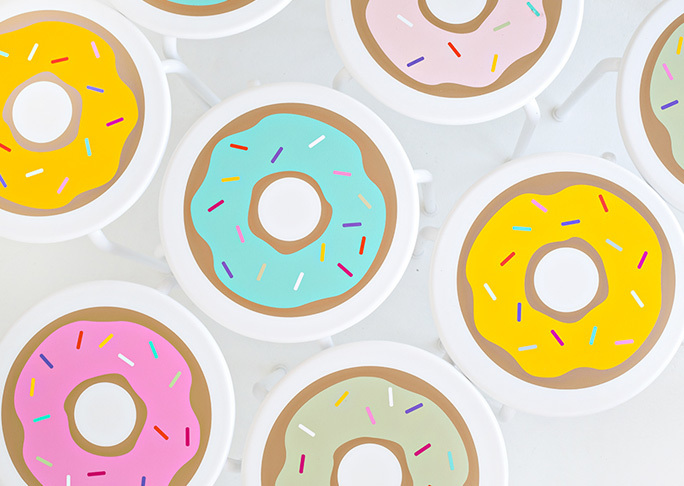 Spruce up your stools with some fun vinyl stickers to turn them into donut stools! See the project at Studio DIY. While this project is incredibly unclear about the materials used to create it, it's an awesome idea and could be re-created with a variety of IKEA leftovers. See the project at Panyl. Every IKEA piece could stand to have its legs replaced with something a little more chic and fashionable. This side table is no exception. Cats love IKEA furniture too! 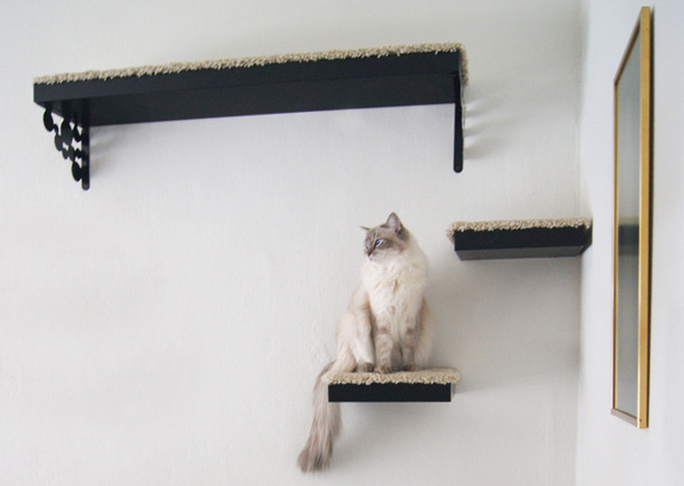 Turn some hanging wall shelves into a floating cat playground. See the project at Tatiana's Delights. 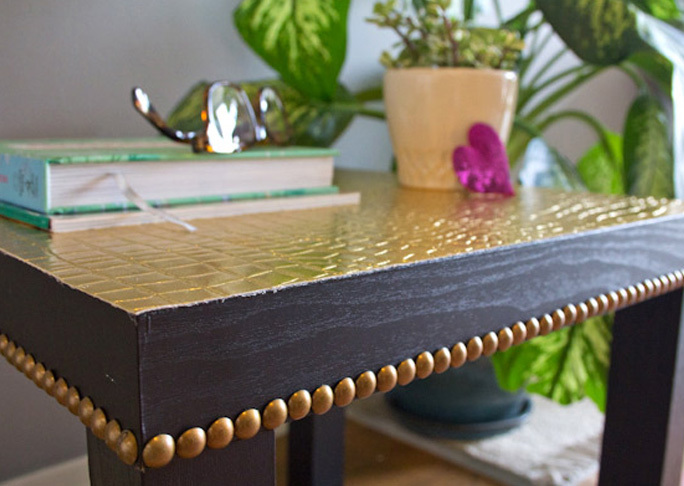 This gold leafed desk is a definite upgrade from the plain white version IKEA sells. Add some glamour to your work day with this beautiful idea. 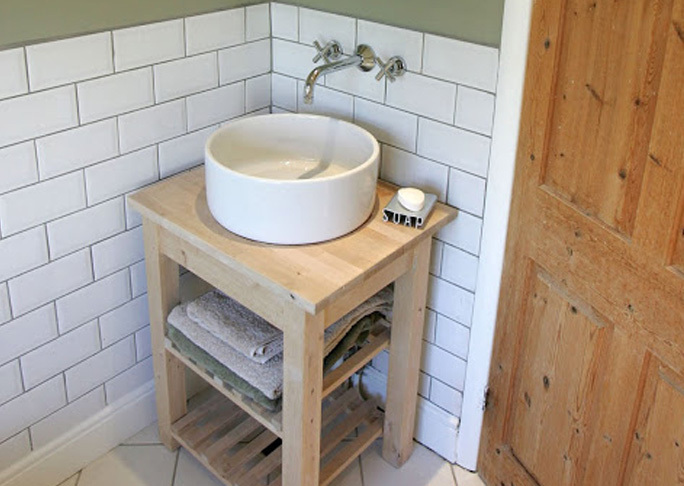 Some of the best IKEA hacks tie together the old with the new. This reclaimed antique door looks incredible paired with these modern table legs. See the project at Content in a Cottage. I love repurposing a product into something new. 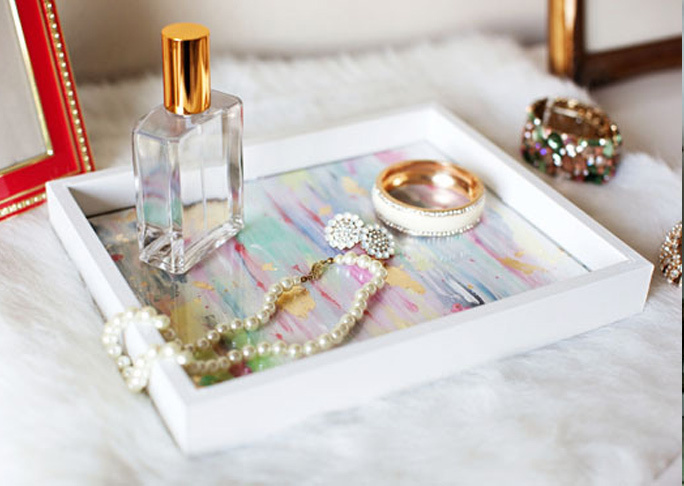 This picture frame turned into a beautiful jewelry tray. Again pairing old with new, you can take some distressed wood and turn it into modern shelves with some of IKEA's metal shelving brackets. Everything looks better with a coat of gold spray paint! 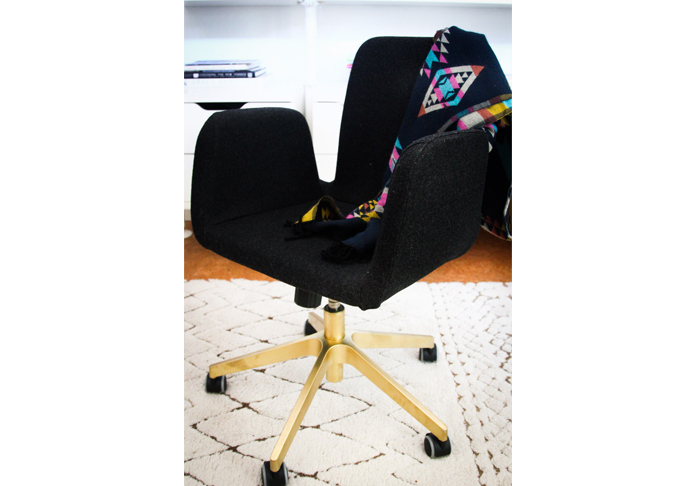 Match your gold leafed desk with an upgraded gold office chair. See the project at Hither & Thither. Even better than gold upgrades are copper upgrades! 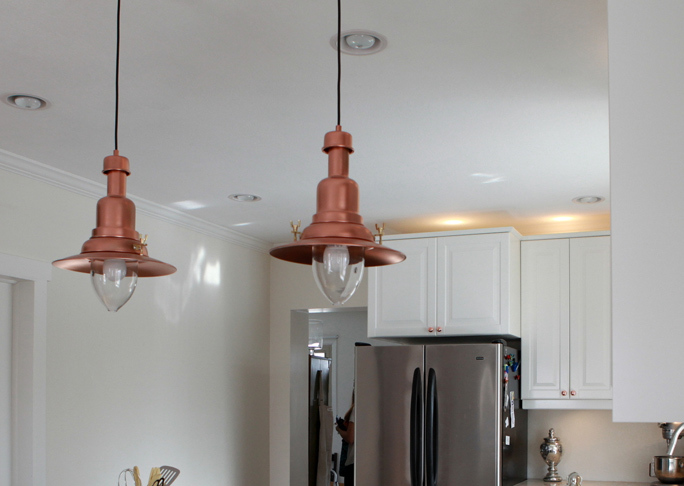 These barn lights add a touch of fun to an old standard design. See the project at Kojodesigns. Need a durable tote bag to bring to the beach? 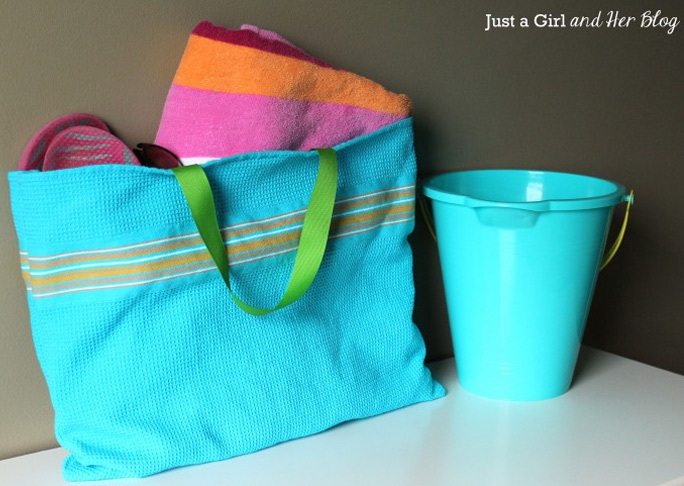 Turn some of IKEA's dish towels into a lovely tote. See the project at Just a Girl and Her Blog. 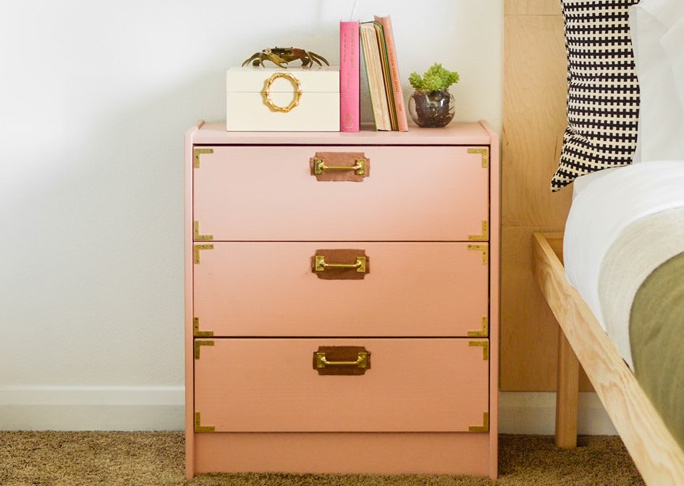 Everyone loves a campaign dresser, and these simple hardware additions make a simple IKEA dresser into something fabulous. 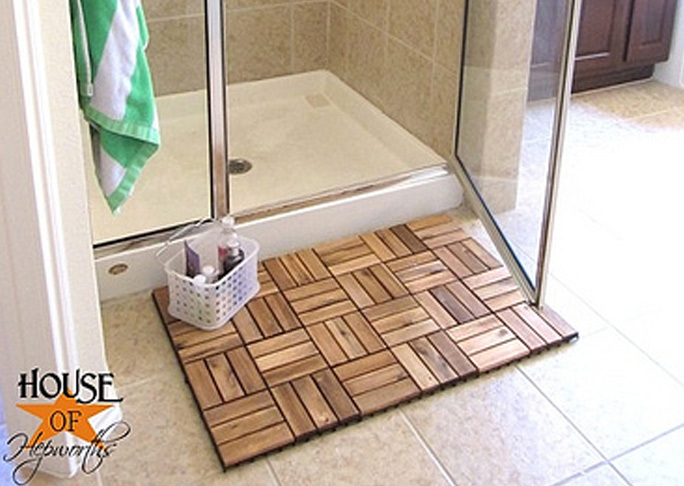 These wooden deck tiles can be joined to make a fancy spa bath mat for your shower. 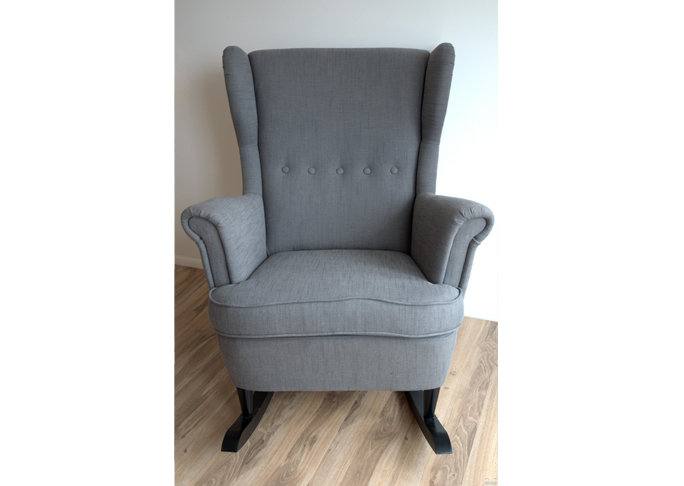 See the project at House of Hepworths. Once more with the gold spray paint. 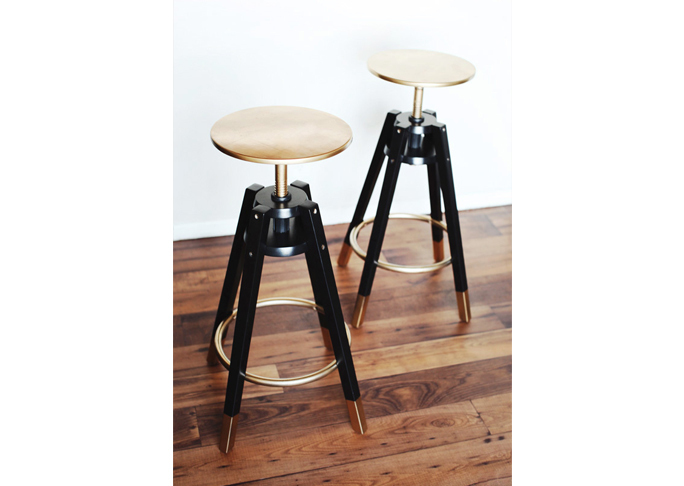 These stools look positively glam with a coat of gold on the legs and seat. We all need more donuts in our life. 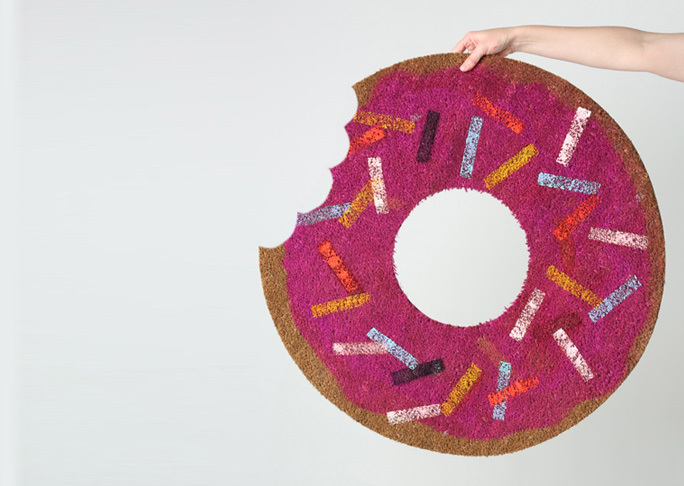 How about a donut rug for your front door? See the project at The House That Lars Built. 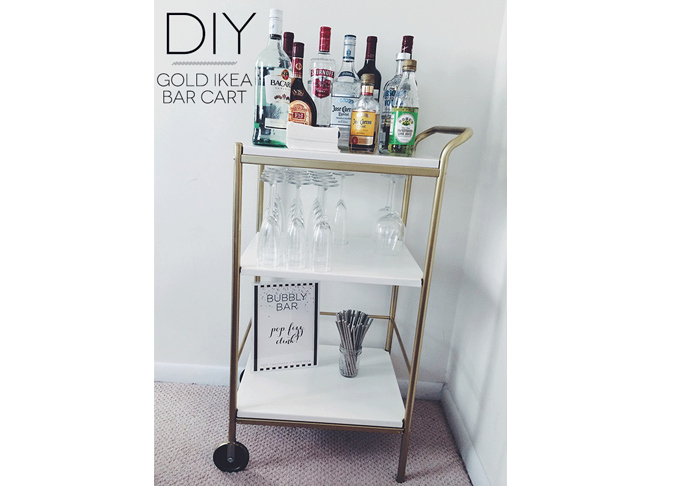 This super simple bar cart also benefited from a little gold spray paint. See the project at Scandalous Beauty Online. 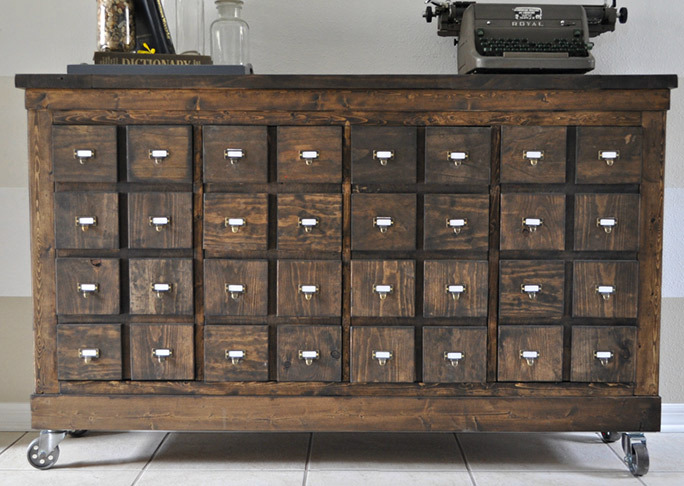 This IKEA hack is truly incredible, turning a simple dresser into an amazing card catalogue. See the project at Sawdust 2 Stitches. 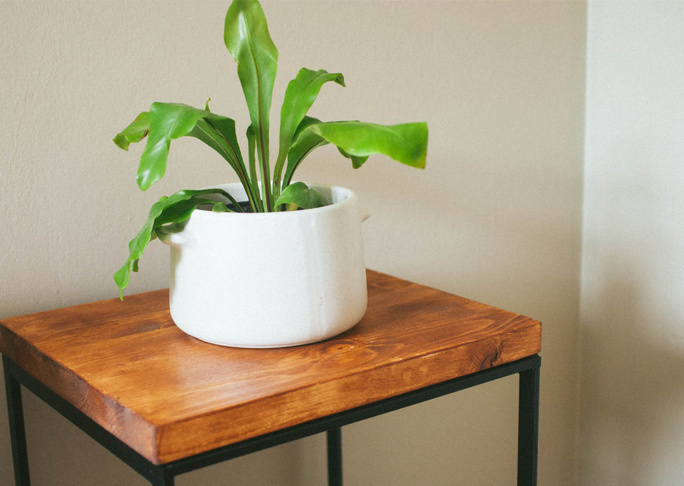 The Lack table series is a cheap solution for a coffee table, but you can make it look like it is worth a lot more with some wooden upgrades. See the project at Simply LKJ. 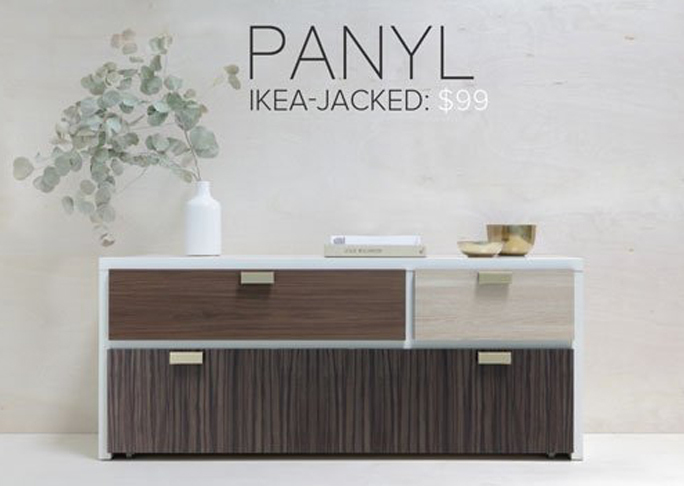 Take a card from the West Elm playbook and turn your IKEA dresser into something fancier with some stick-on paneling from Panyl. I'm going to turn all of my chairs into rocking chairs now. See the project at Interiors by Kenz. 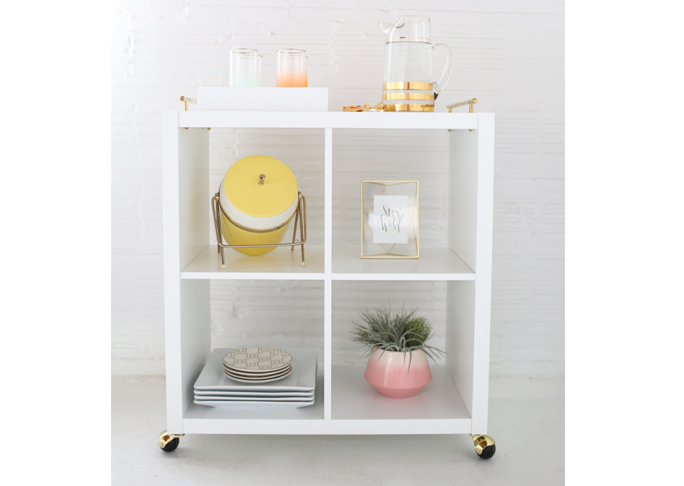 One more bar cart for the round up, this one from a simple bookcase. 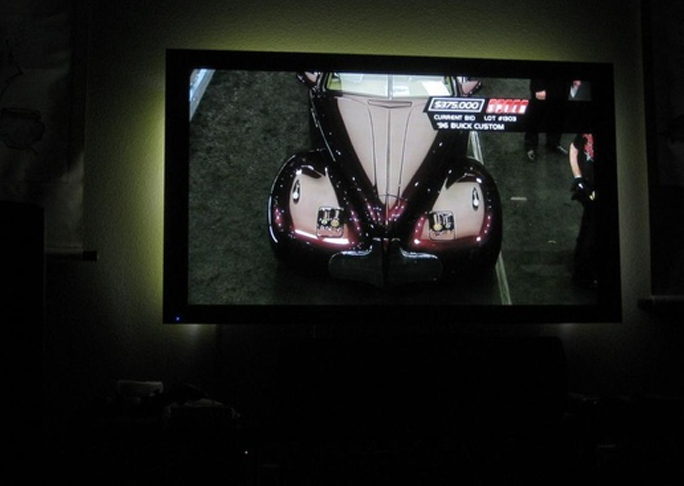 Putting some ambient light behind your TV screen can make for a more enjoyable viewing experience at night. These simple IKEA lights do the job on the cheap. See the project at AVS Forum. 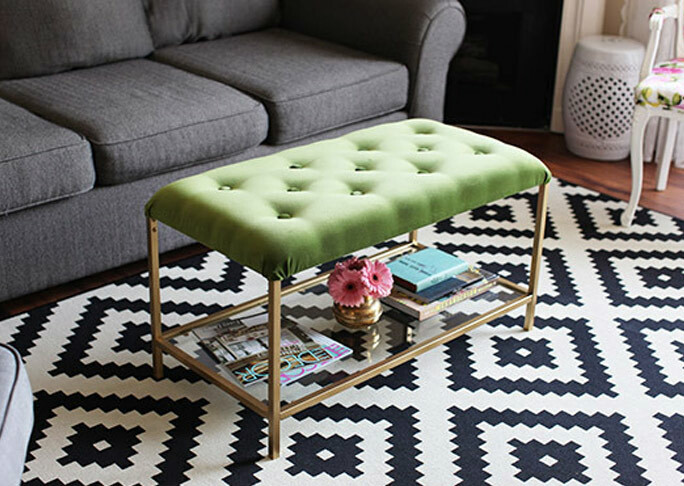 This small upholstery project turns a simple side table into a gorgeous padded bench. 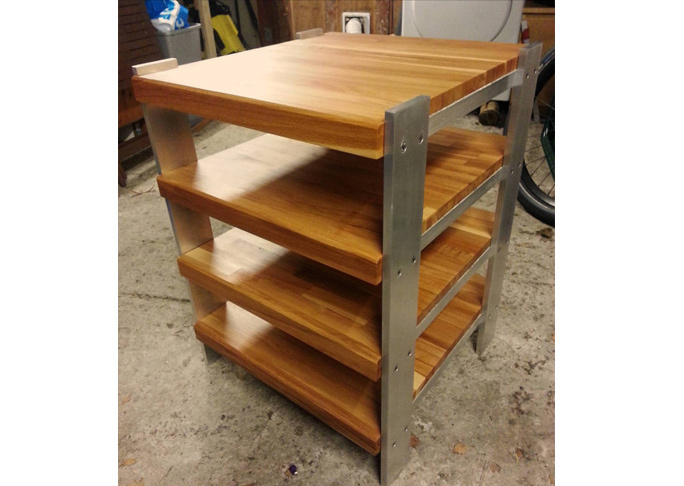 This ingenious hack turns some IKEA cutting boards into a HiFi rack for your stereo equipment. 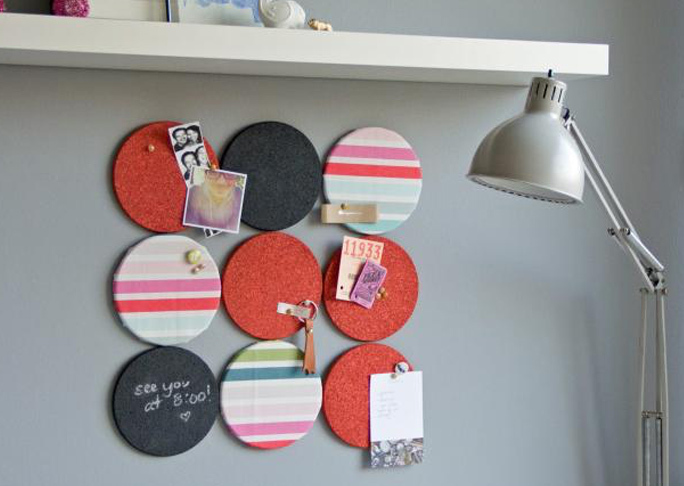 Add some color to your office wall with some fabric covered bulletin boards. These fun circle shapes are available at IKEA, and you can paint them too! See the project at HGTV. 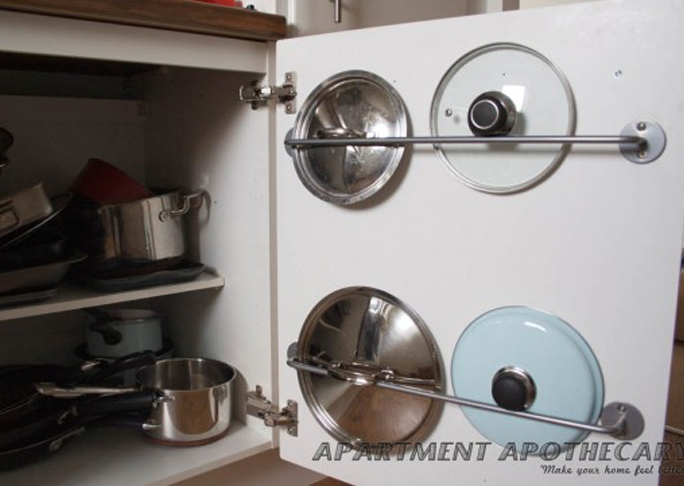 Tired of dealing with all your pot lids floating around inside of your cabinets? These towel racks make the perfect lid organizers. See the project at Apartment Apothecary. 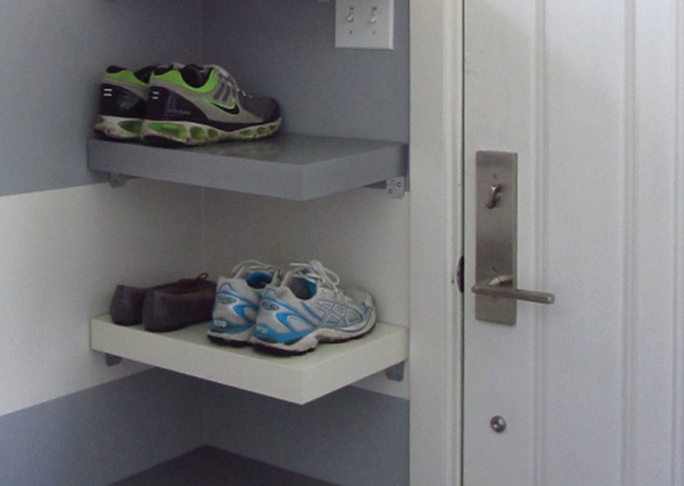 If your family has a shoes-lying-around-the-house problem, consider some hanging shelves to organize them by the garage door. See the project at Planq Studio. 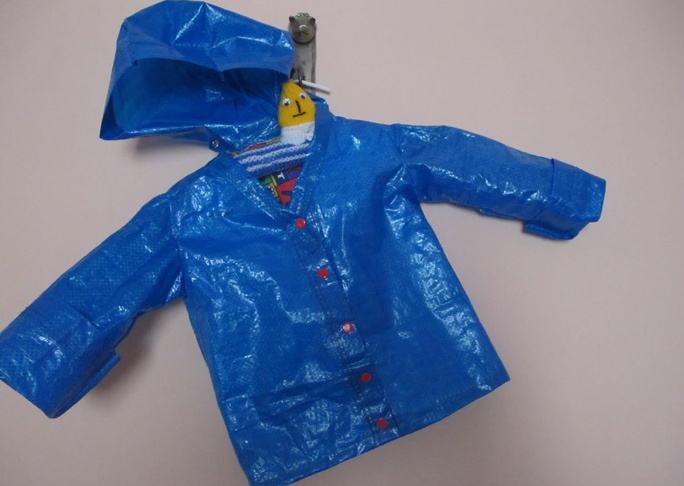 By far the cheapest hack on this list, you can turn a ninety-nine-cent blue bag into a raincoat for a little one. Need a small and easy place to charge your phone overnight? This hanging shelf will do the job nicely. See the project at Coulda Woulda Pica. 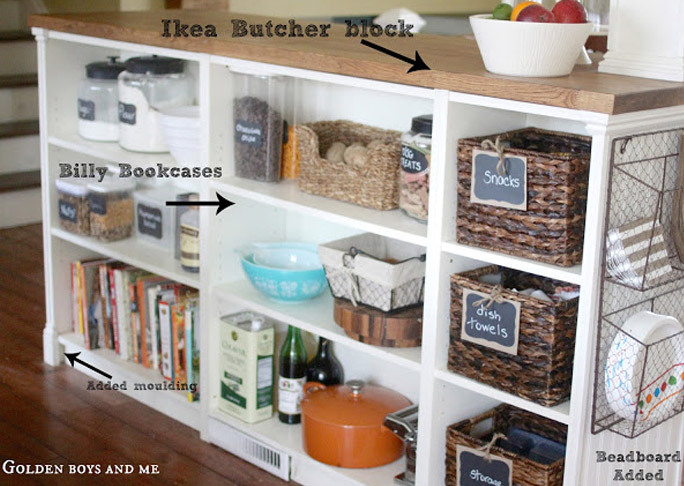 This genius turns some Billy bookcases into a kitchen island. Some of the best repurposing we have seen. See the project at Golden Boys & Me. 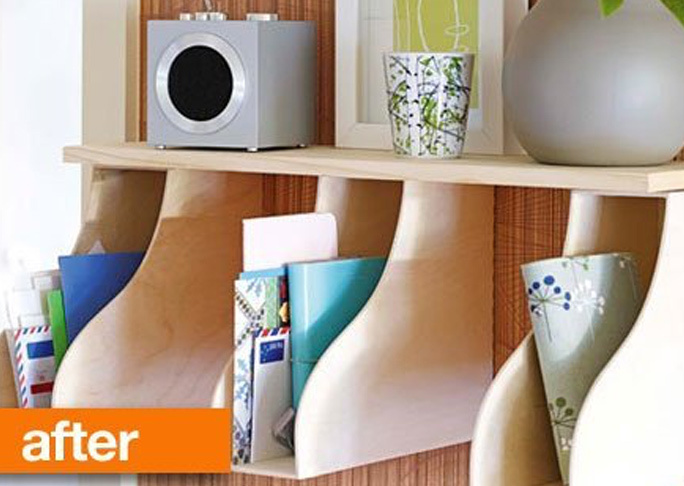 Again we have the ever useful file organizers. These ones have been put together as a mail catch-all hung on the entryway wall. Old fashioned sewing tables were ingenious at holding the machines. 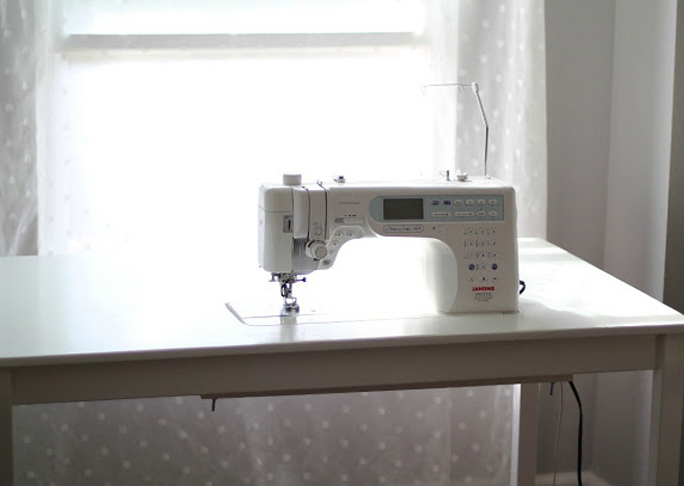 This simple upgrade turns an IKEA desk into a beautiful and minimal sewing table. This brilliant IKEA hacker built her own lockers on her porch to store clothes and shoes from the day. That's a great way to keep a clean house. See the project at Polka Dot Chair. 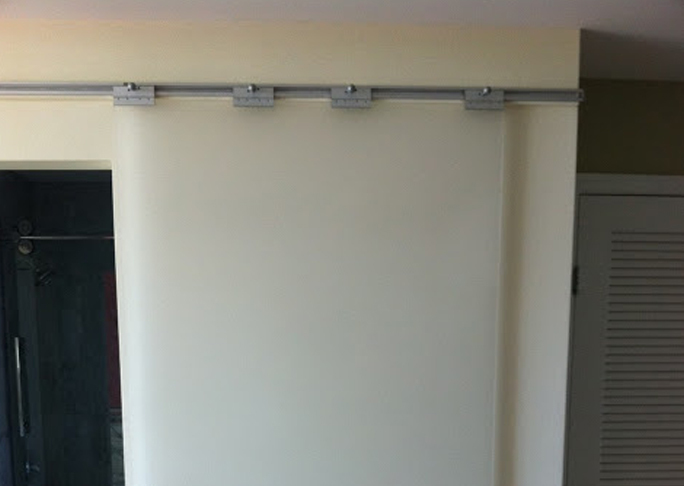 Always wanted some sliding doors in your house? 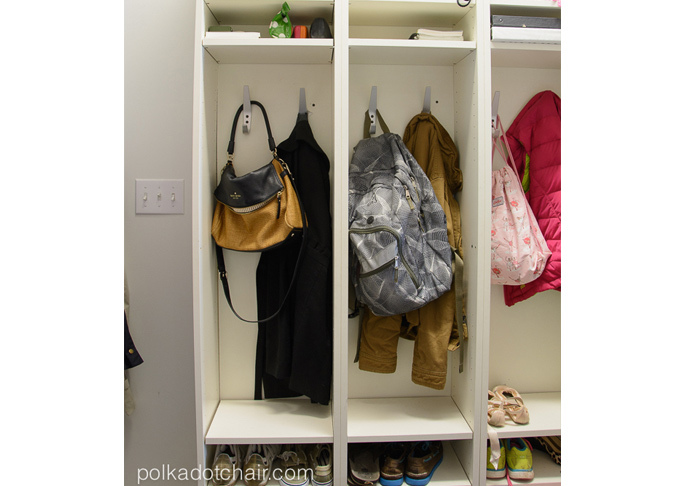 You can hack the Pax closet system to add them to every doorway in your home. 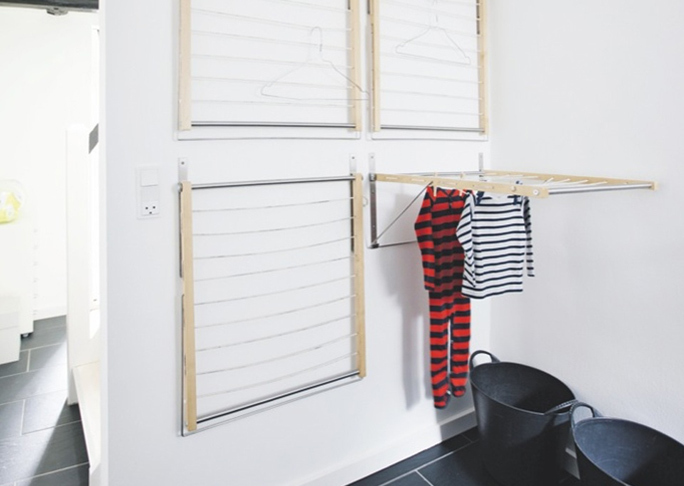 Here's an ingenious way to dry your clothing without taking up a lot of space. See the project at BOLIG. 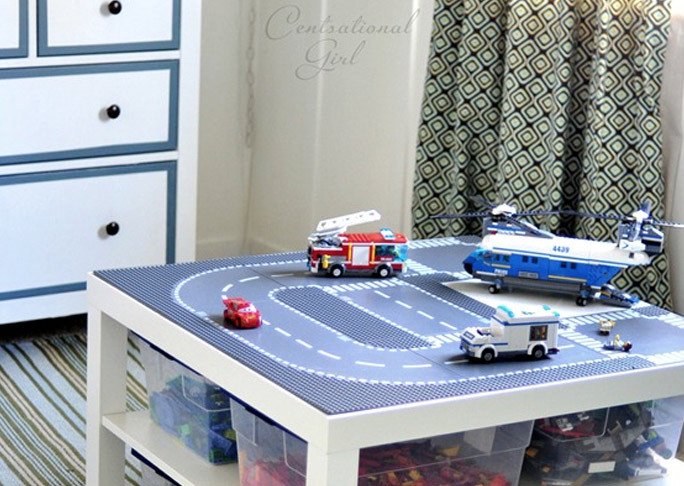 A Lack table upgrade for the kids---you can make any IKEA table into a Lego play space. See the project at Centsational Girl. A fond iMac user myself, I would love to hack together a minimal standing desk to use. Perfect for an apartment dweller. 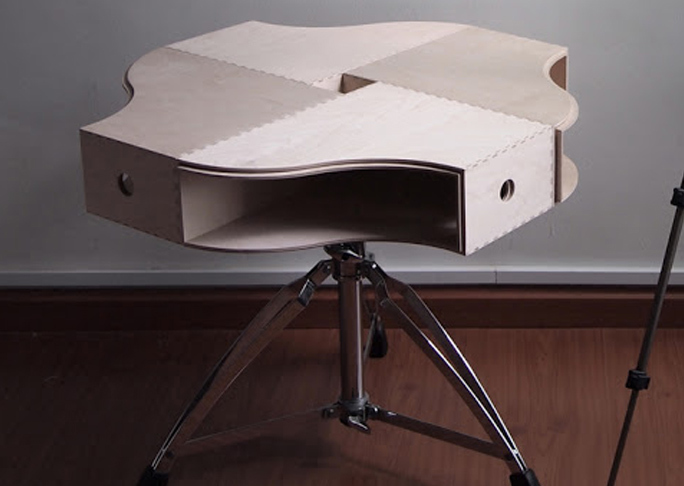 A guitar made from an IKEA table. Yep, enough said. 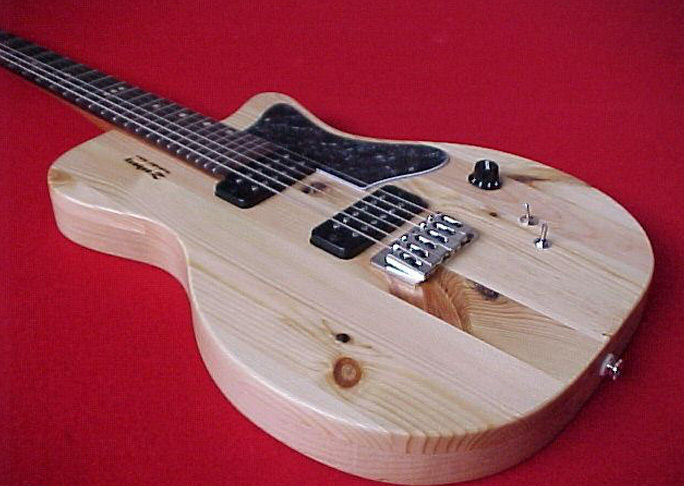 See the project at Zachary Guitars. 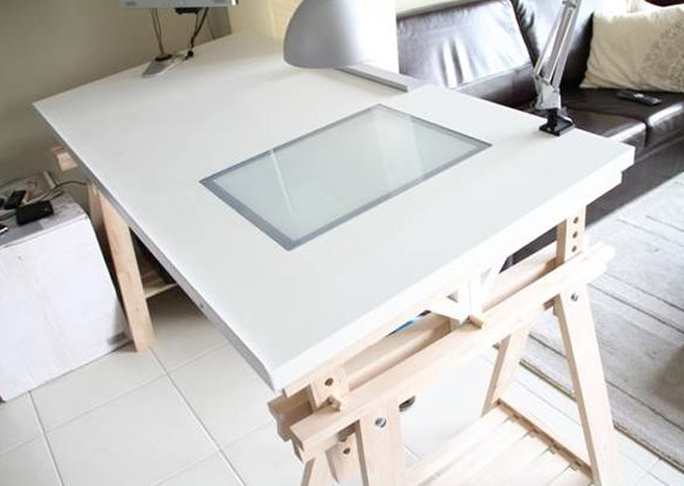 This simple hack deals with one of the flaws of the IKEA drawing tables. IKEA should take note and add it to the plans. 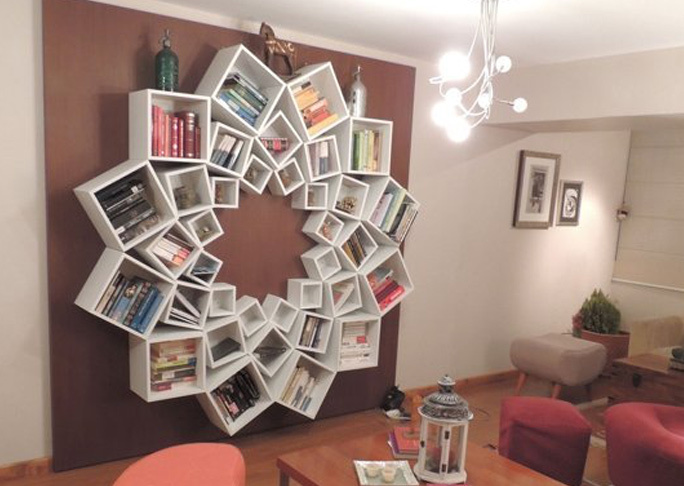 The most beautiful bookcase arrangement on the internet. What other shapes could you form out of IKEA bookcase cubes? 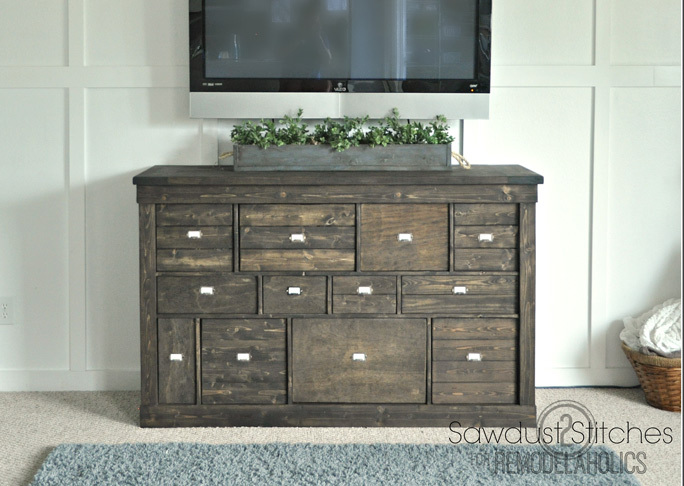 Another faux West Elm project, this dresser has been upgraded to look super chic with wood paneling as well. See the project at For My Love Of. One more retailer inspired piece, this one is from Pottery Barn. A really cool upgrade, and I can barely tell the difference. See the project at Remodelaholic. 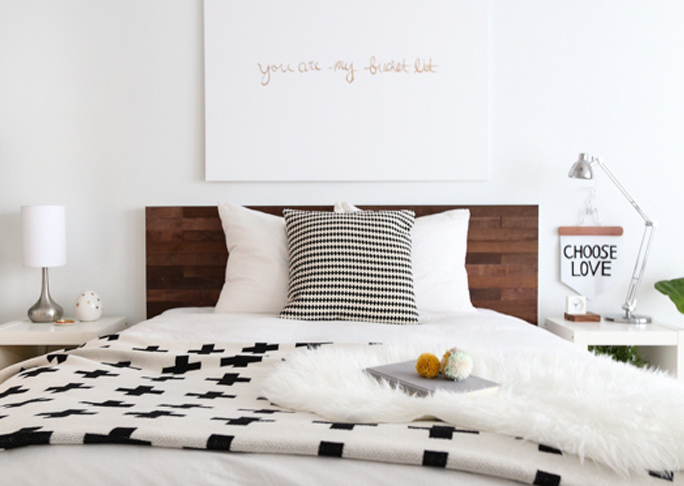 A padded headboard seems essential for a modern bedroom. This is a simple upgrade from one of IKEA's standard units. See the project at Place of My Taste. 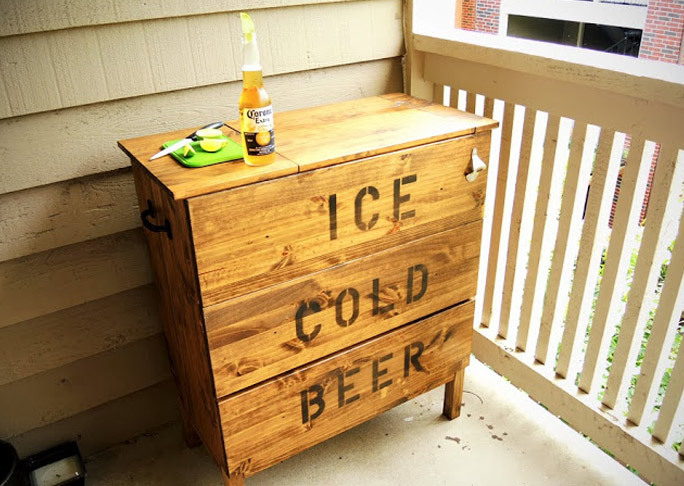 Got to keep all your beverages cold in the summer, and here is how to make your own custom ice chest out of an IKEA dresser. 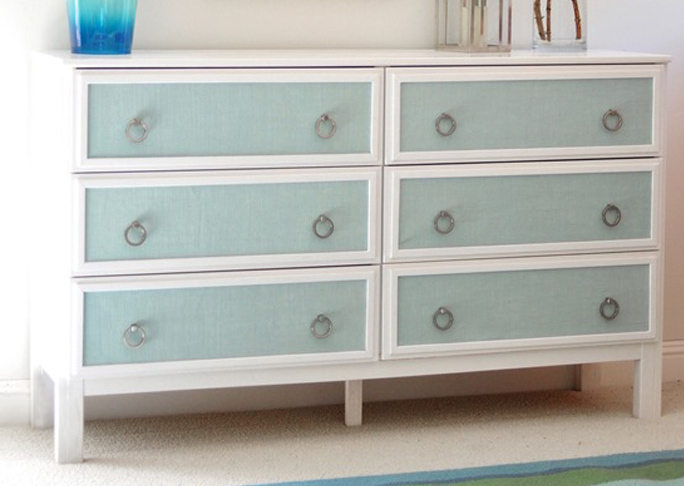 This dresser upgrade uses fabric to add a little texture to a plain design. 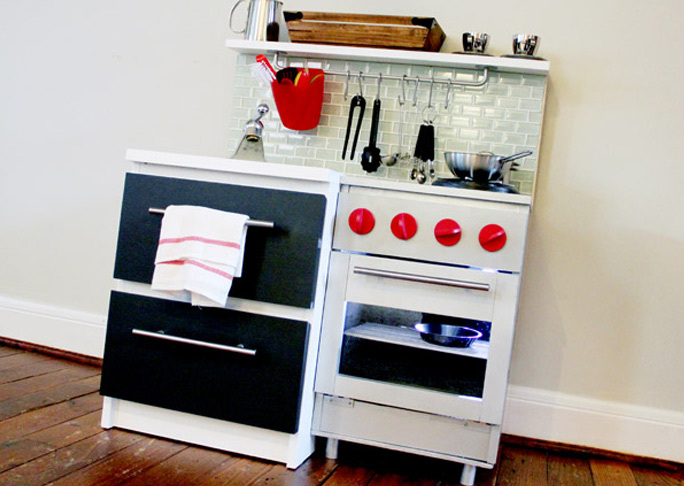 Sometimes a kitchen accessory can make for a perfect toy upgrade. 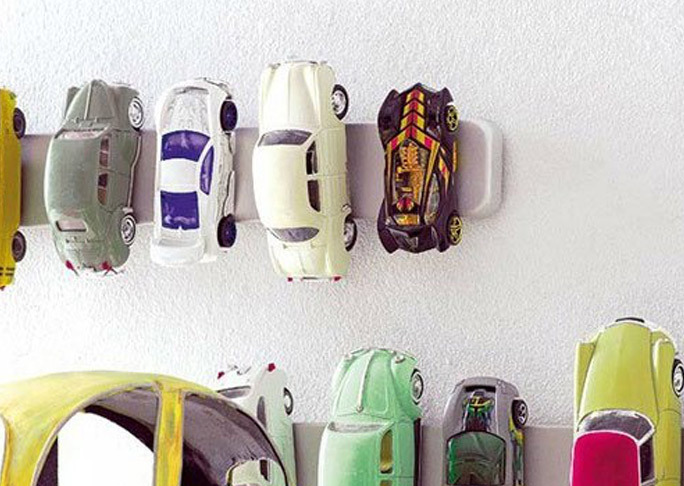 These magnetic knife racks are a great way to store toy cars. See the project at The Style Files. 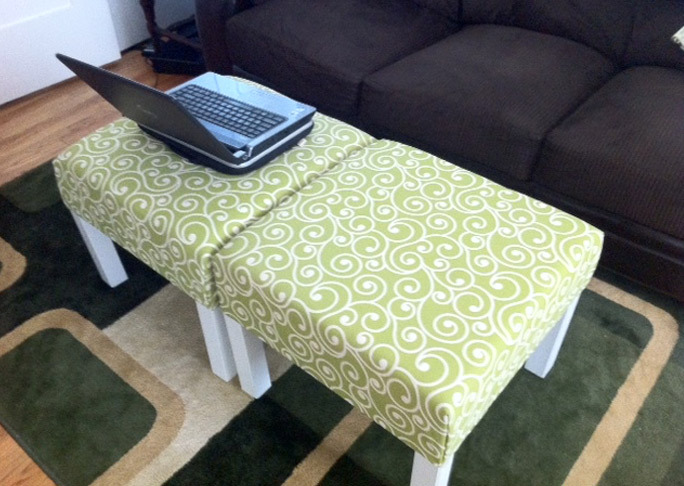 One more padded ottoman idea, this one upgrades a simple Lack table into someplace comfy to lay your feet. Add some faux leather and nailhead trim to the Lack table to make it a glamorous talking piece for your living room.